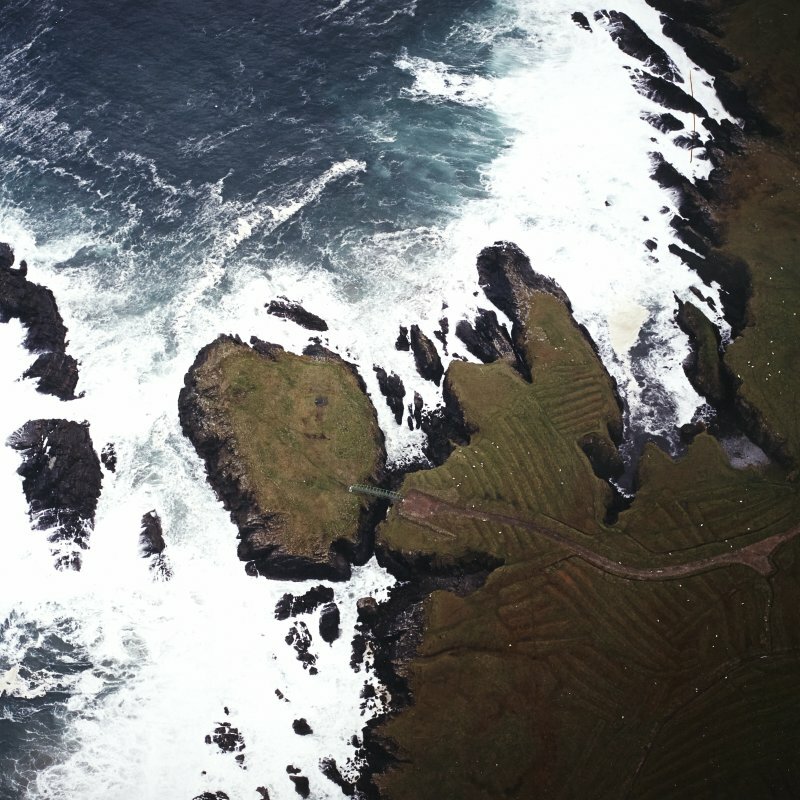 Oblique aerial view of Dun Eistean, taken from the SSE. General oblique aerial view centred on the remains of the island settlement with the remains of lazy beds adjacent, taken from the NNE. Oblique aerial view centred on the remains of the settlement with the remains of lazy beds adjacent, taken from the W.
NB56NW 1 centred 5355 6501. 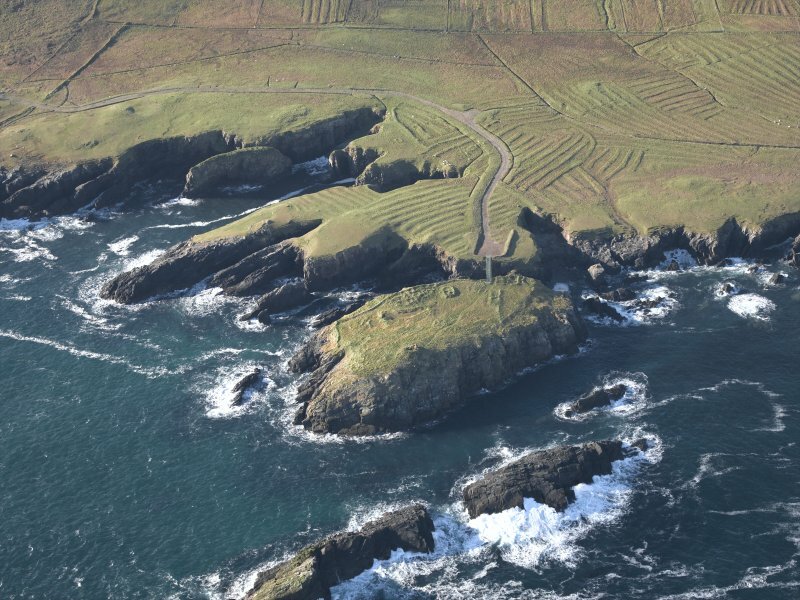 Dun Eistein is a flat-topped island, about 75 yards by 50 yards, separated from the mainland by a ravine 30-40ft broad and of similar depth. Along the edge of the ravine are the remains of a strong wall, through which, it is said, there were squints or loop-holes. 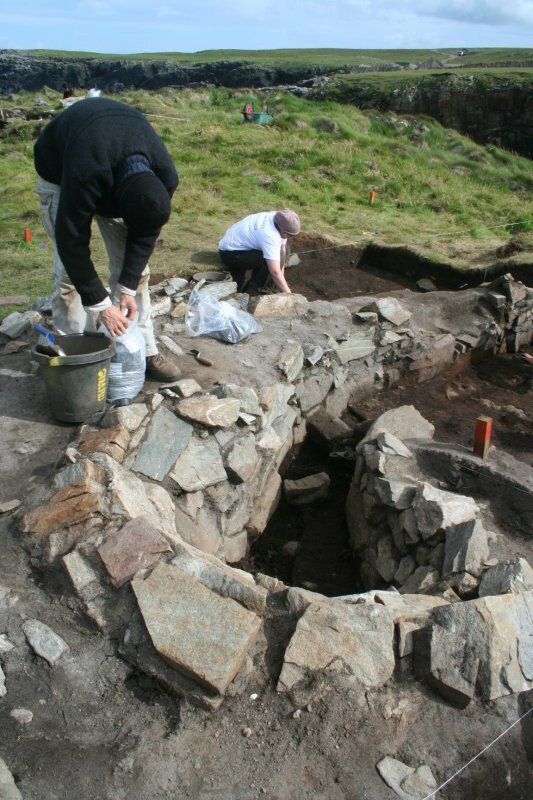 Towards the NE corner of the island are the ruins of a dun, sometimes called "Tigh nan Arm" (the House of Arms), built of drystone masonry and reduced to a height of 4 1/2ft: externally it is a rectangle, 23ft x 18ft, but the central area is oval, 6 1/2ft x 4 1/4ft. There is no trace of a doorway and the entrance was probably on the first floor. 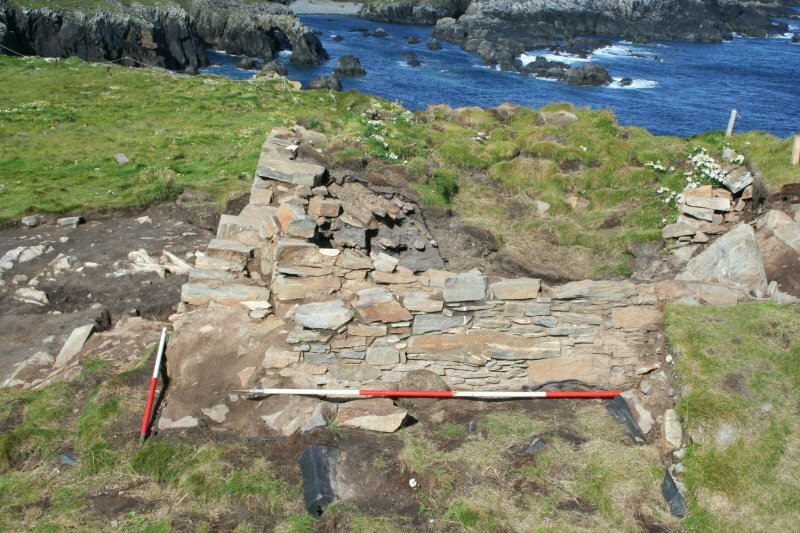 There are remains of houses on the island said to have been built by the Morrisons, about 1597, and on the S side is a ledge, 'Palla na Biorlinn', where they used to haul up their boat. The 'tigh' appears to have been an incipient peel, but is probably 12th century. Dun Eistean: in 1914 the wall along the ravine was 6ft wide and 1 1/2ft high. 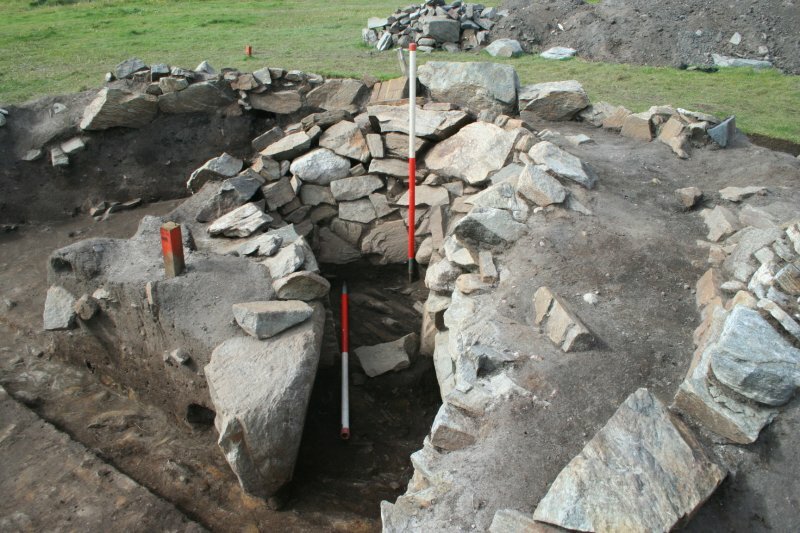 Behind it were the foundations of a group of small huts inpinging on one another and an oval enclosure, 29ft x 13ft internally, containing a hut circle, 6 1/2ft in diameter, and three other small oval compartments. The 'tigh' was described as 10ft high, lying ESE and 115 WNW. 35 yards south of it there was an artificial pond, banked on the E and excavated on the W, still showing moisture. 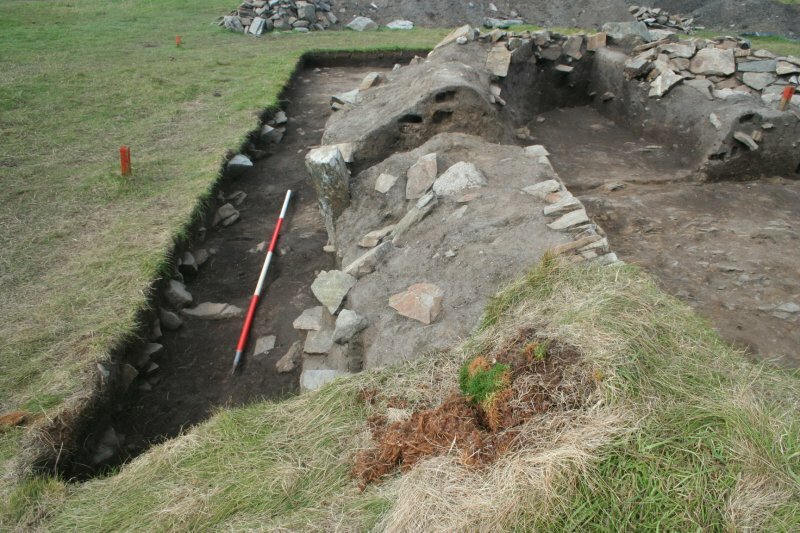 Dun Eistean appears to be a settlement, probably medieval, comprising a complex of small rectangular stone built huts with rounded corners, now heavily turfed, and defended by the remains of a stone-built wall c. 1.8m wide and c. 0.5m high, which runs along the top of the ravine. The pond, now dry, has been created by damming the E end of a small hollow. 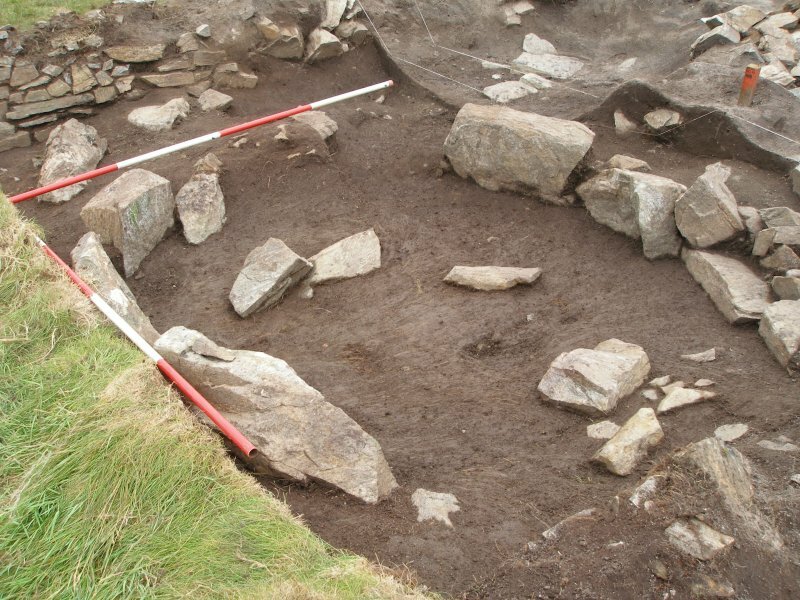 The oval enclosure described by the Commission is actually a rectangular hut with rounded ends, with settings of stones within, suggesting oval compartments. This is one of apparently three main huts. There is nothing to suggest monastic associations. ??? The 'tigh' is an oval, turf-covered stony mound c.13.5m by c.10.5m, and 2.2m maximum height. 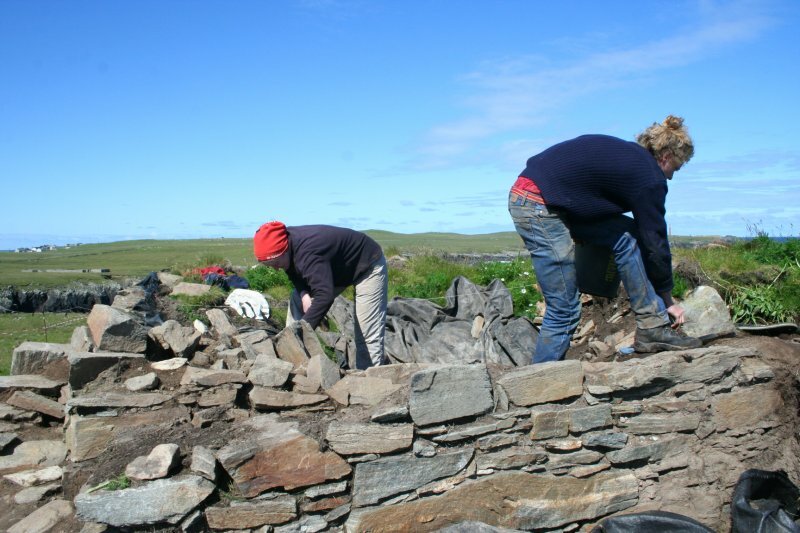 Many of the stones are small rectangular blocks, suitable for building, but there is no trace of built walling. 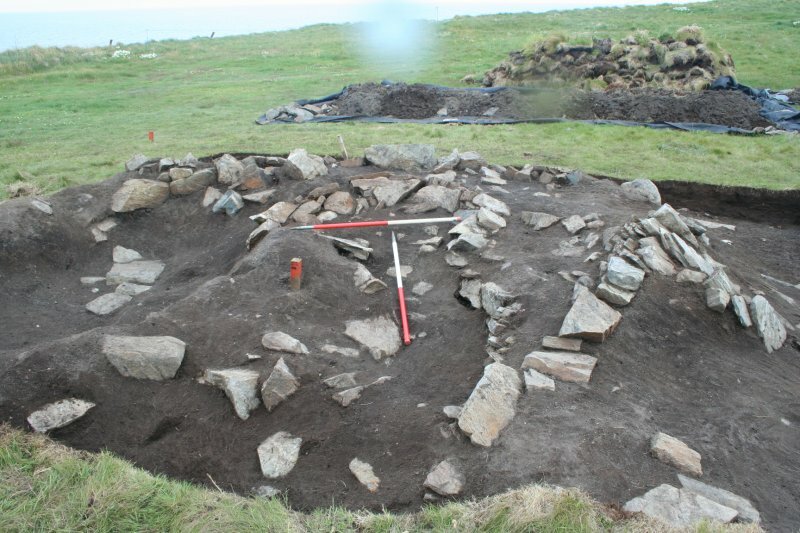 An excavation in the centre, probably for material to build the modern marker cairn on the west side of the mound, has revealed a content of earth and stones only. Impossible to classify. The name 'Tigh nan Arm' is not known locally. Visited by OS (R L) 16 June 1969. Scheduled as Dun Eistean, fort and dun. Information from Historic Scotland, scheduling document dated 19 March 1992. 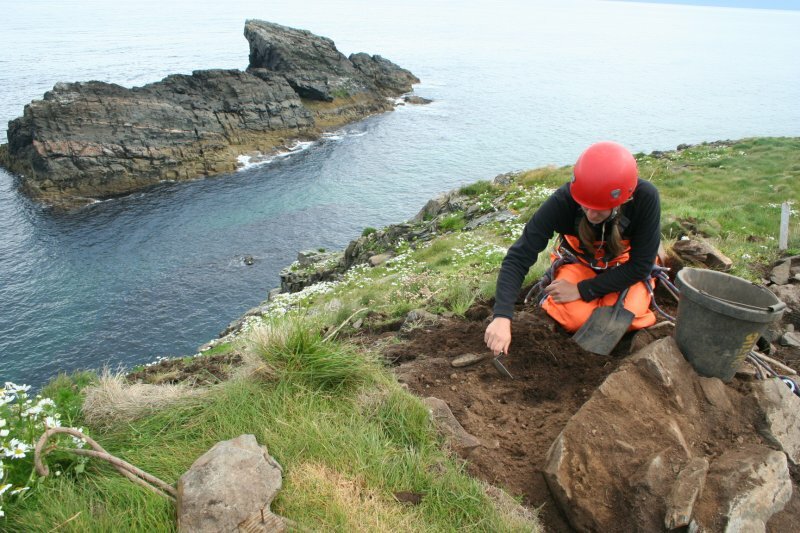 Glasgow University Archaeological Research Division carried out a survey of the ruined buildings and associated features found on the cliff-bound tidal island of Dun Eistean, in 2000. 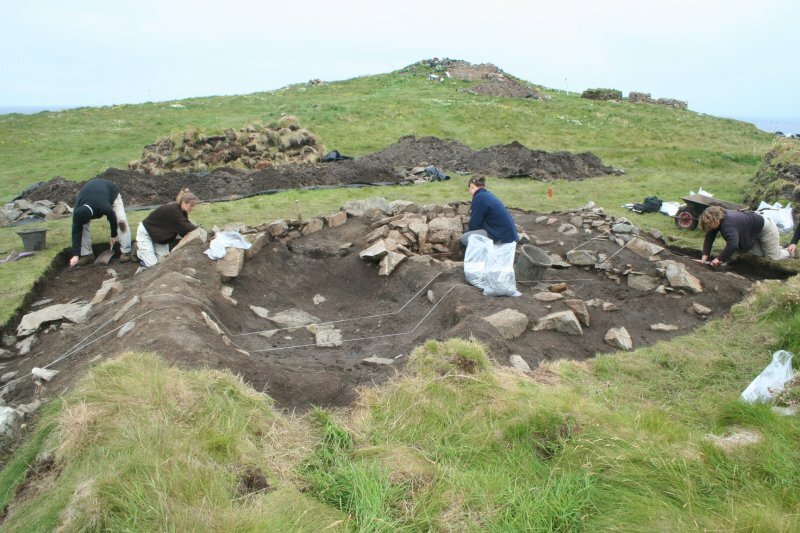 This report is published in electronic format at http://www.gla.ac.uk/Acad/Archaeology/GUARD/reports/716-1. NB 5355 6501 Work was carried out in May 2000 and May and June 2001 on the tidal island of Dun Eistean (NMRS NB56NW 01). 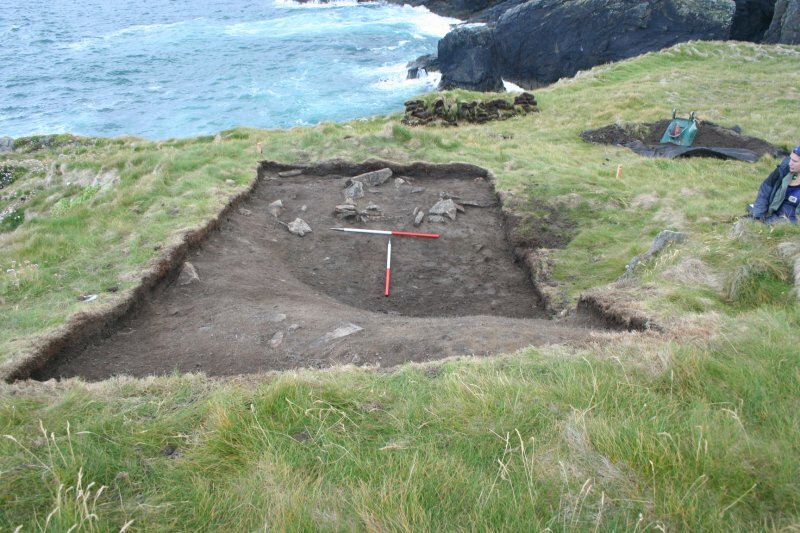 This represented the initial stage of a long-term project to investigate the archaeology on the island. The island is believed to be the ancestral home of the Clan Morrison. The survey made a detailed record of the existing remains and enabled a preliminary statement regarding their age, function and condition. It was seen that there are eight main structures on the island. 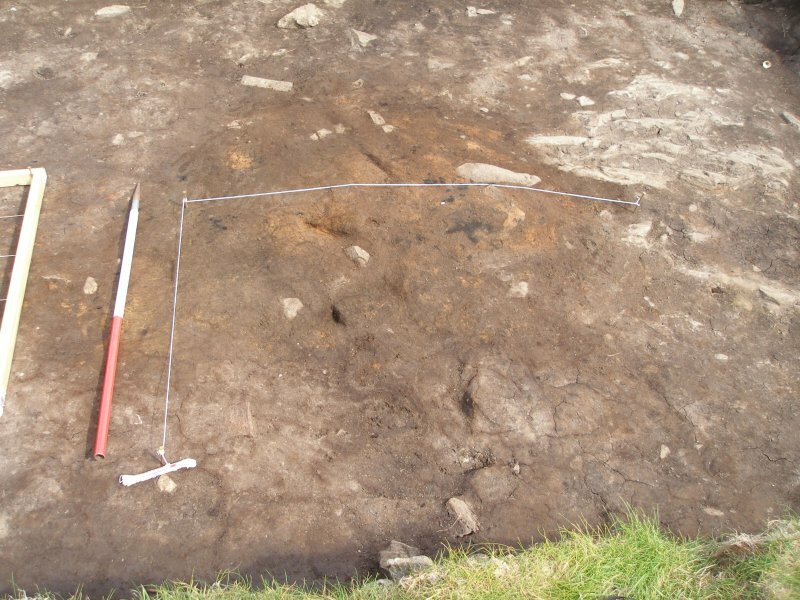 These are all well preserved and, given the varied morphology, they may indicate activity from the Iron Age through to the post-medieval period. 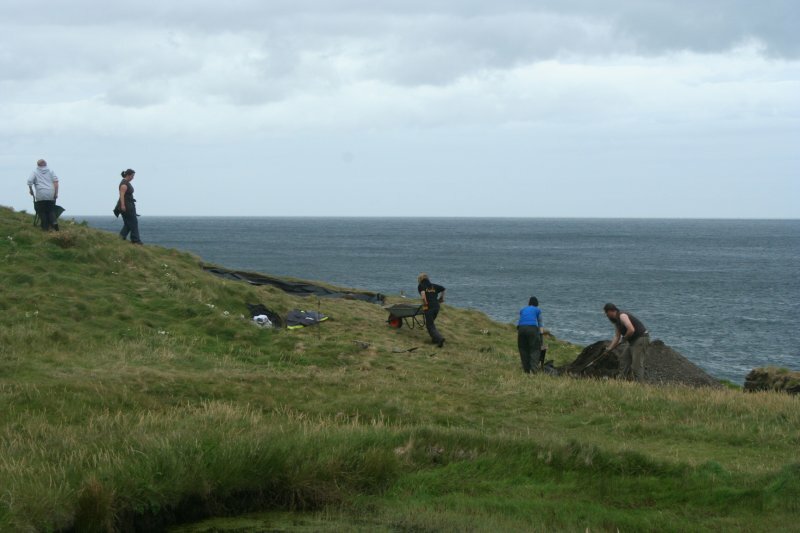 The mainland peninsula adjacent to Dun Eistean was also surveyed. The entire area is almost covered in cultivation remains or lazy beds, and four other structures were also revealed, but these are probably natural. A geophysical survey was conducted in May 2001 and revealed further structures separate from and related to the existing ones. Resistivity and gradiometer surveys were conducted, the latter being more successful. 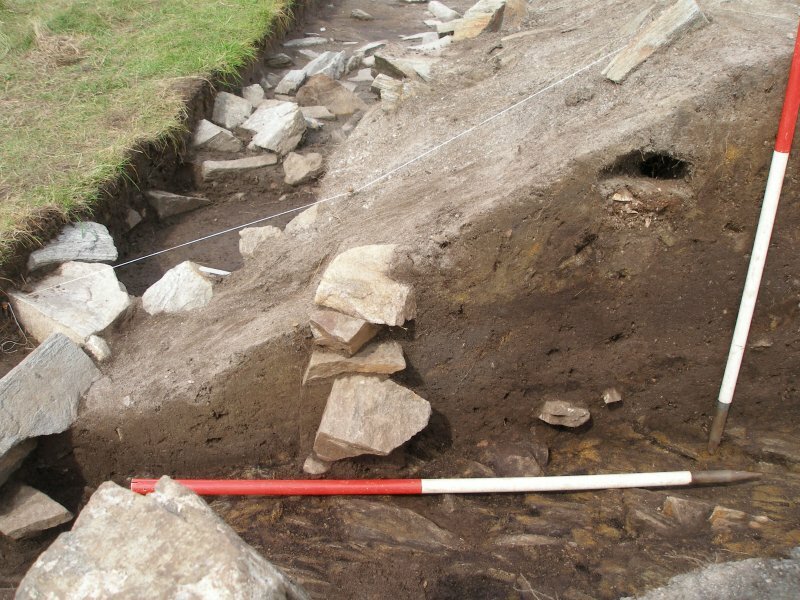 Two positive linear anomalies approximately 3m wide and with a gap of 1.5m possibly indicate a rock-cut ditch around the main Structure G. There is a gap to the S of this anomaly of 1.5m which may indicate a causeway or entrance. Another significant anomaly lay immediately to the E of Structure A, which may indicate an area of intensive burning. 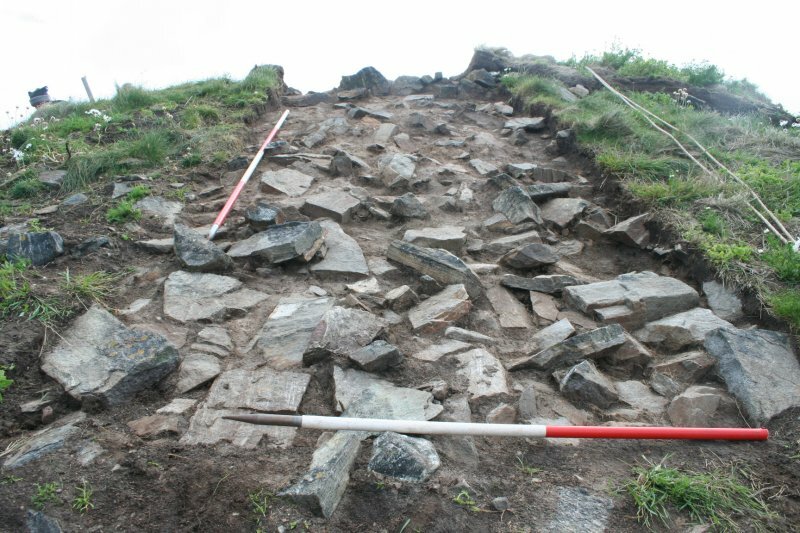 Four trenches were opened during the trial excavation, which followed the geophysical survey. 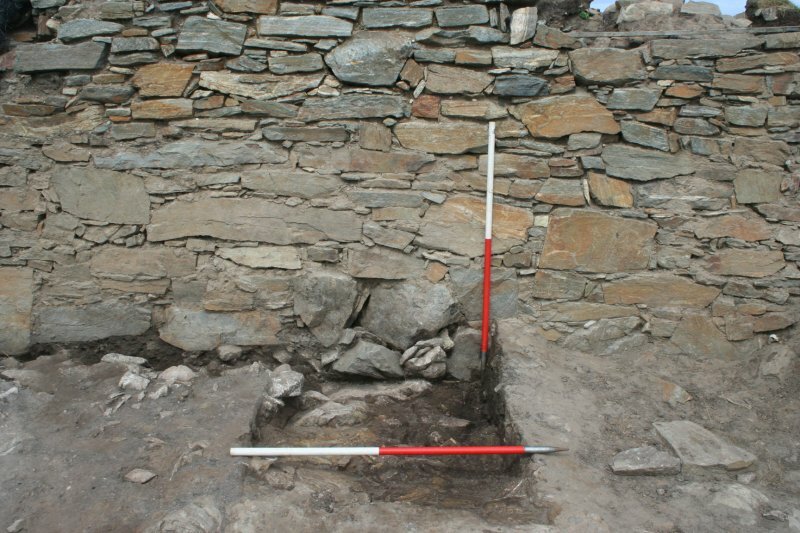 Trench 1 measured 8 x 2m and lay N-S across the southern half of Structure G. This uncovered a mass of tumbled masonry, under which stood the perfectly preserved remains of a clay-bonded stone wall, to a height of 1.5m. 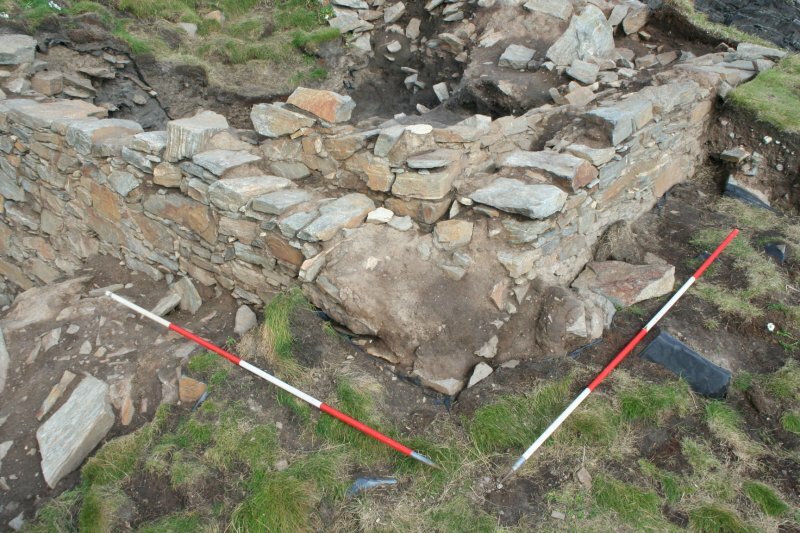 This indicated that the structure is a small keep or tower house, approximately 3 x 4m in plan. No entrance or other features were found, although a stone tile was recovered which may have been from the roof of the building. 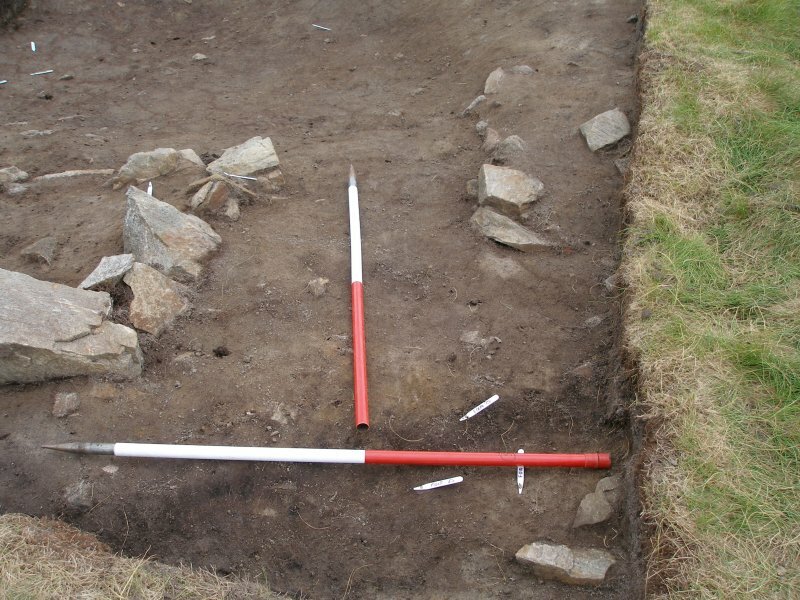 Trench 2 measured 3 x 5m and was situated over a possible feature indicated by the geophysical survey. Unfortunately this turned out to be outcropping bedrock. 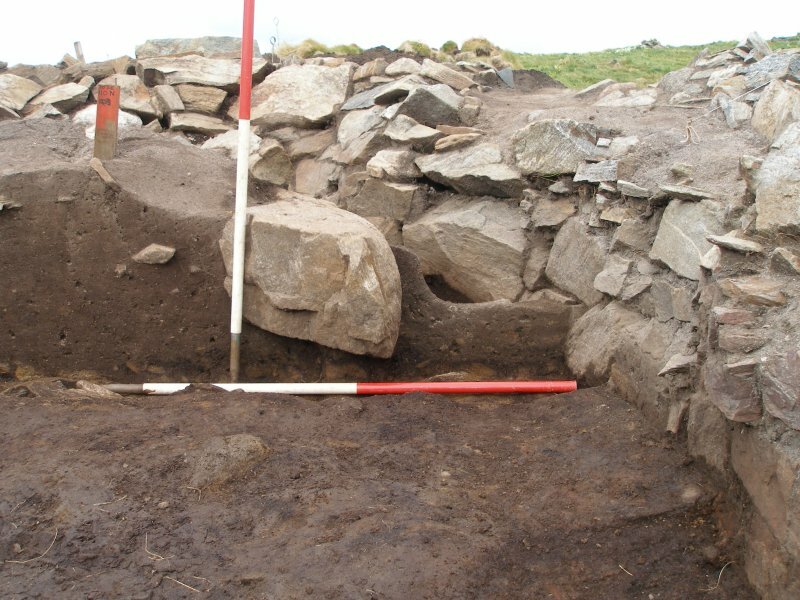 Trench 3 measured 4 x 2m and was placed within cell 12 of Structure D, also incorporating part of Structure H. This wall was revealed as being mainly built of turf, with some revetting on the external face. 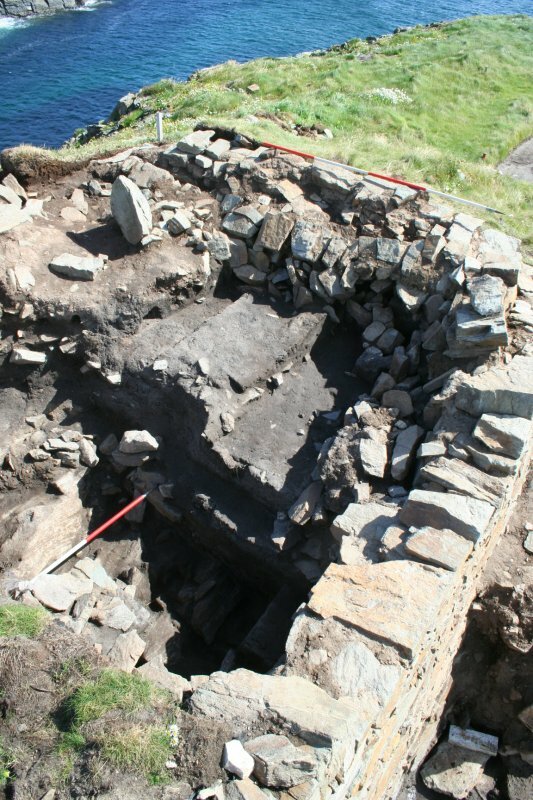 The sides of the cell were also constructed from turf and were built against the external wall. 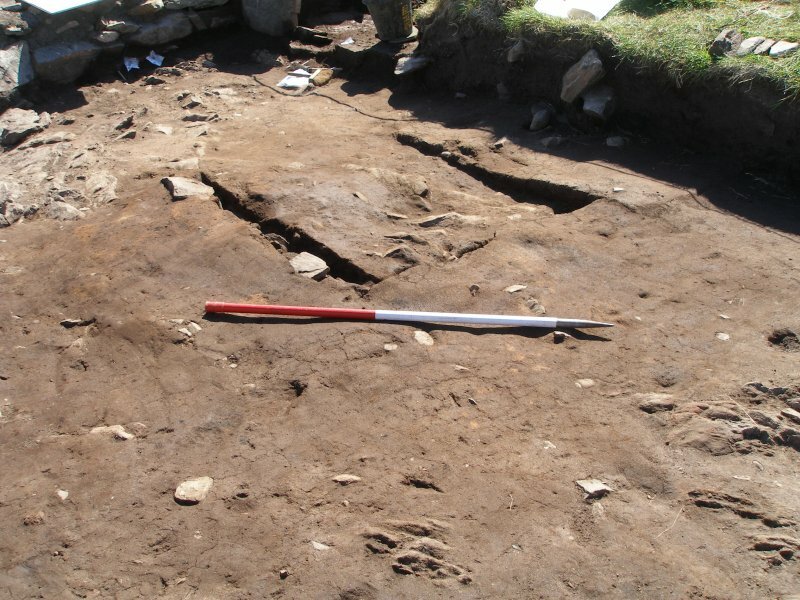 Although no hearth was present, an occupation floor was excavated, which contained approximately 100 sherds of pottery, 19 pieces of burnt bone, four lithics and a piece of slag. 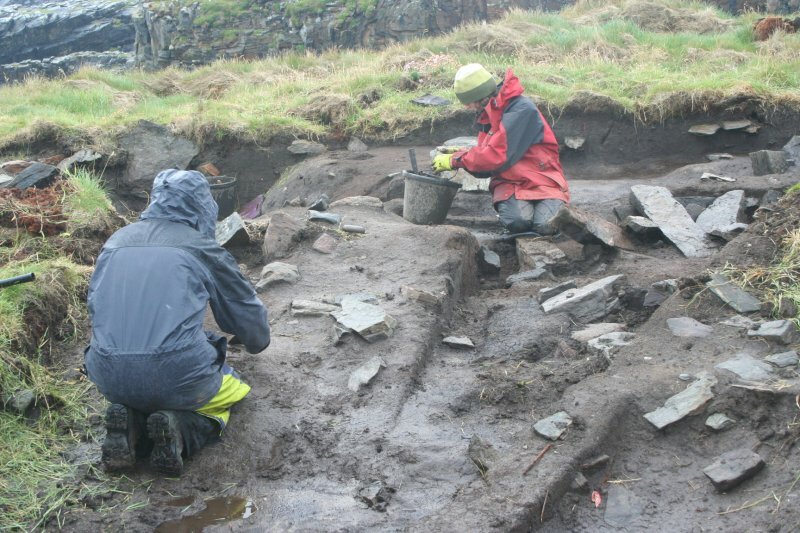 The pottery is mostly Craggan Ware, although two diagnostic sherds were recovered, one of green-glazed pottery, and the other of a decorated, brown, salt-glazed ware which has been identified as coming from Germany. 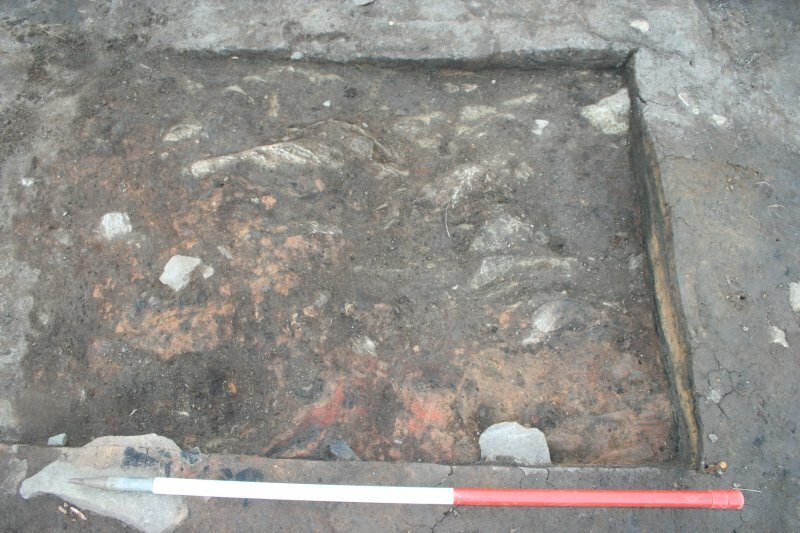 Trench 4 measured 4 x 2m and was situated over the first cell of Structure A. 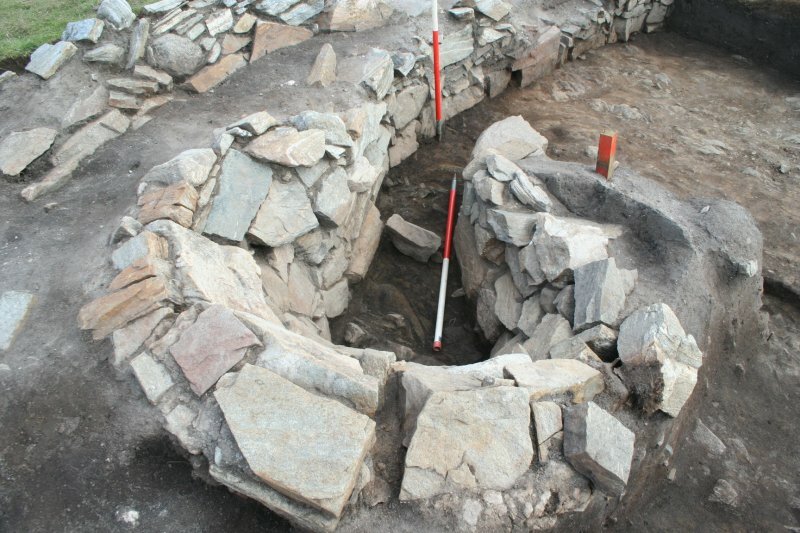 A stone and turf wall was revealed, and a small stone partition. 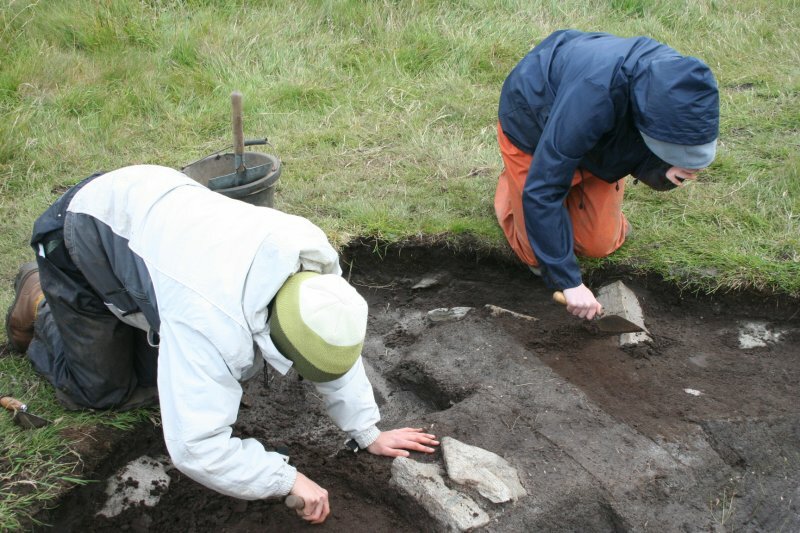 Approximately 50 sherds were recovered from this trench, plus the occasional quartz flake. Again the pottery had a fine black fabric, and is probably Craggan Ware. 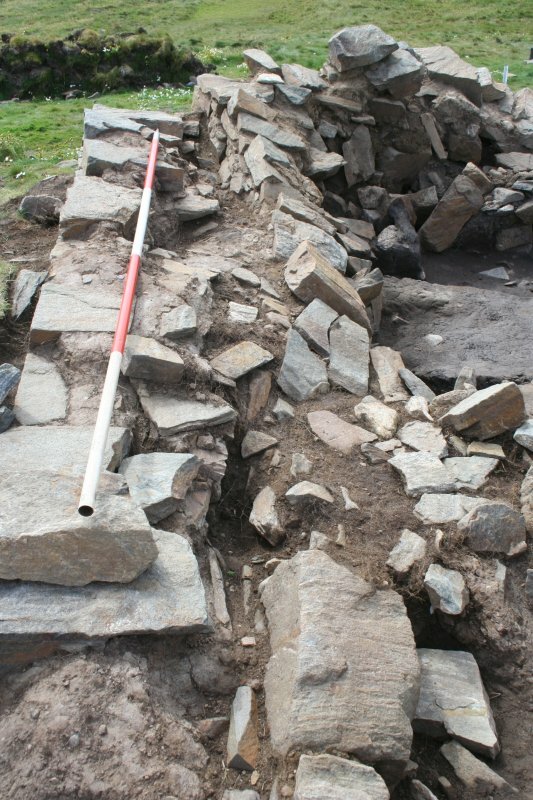 All the trenches were backfilled, and a more extensive excavation of the structures is planned in the future. 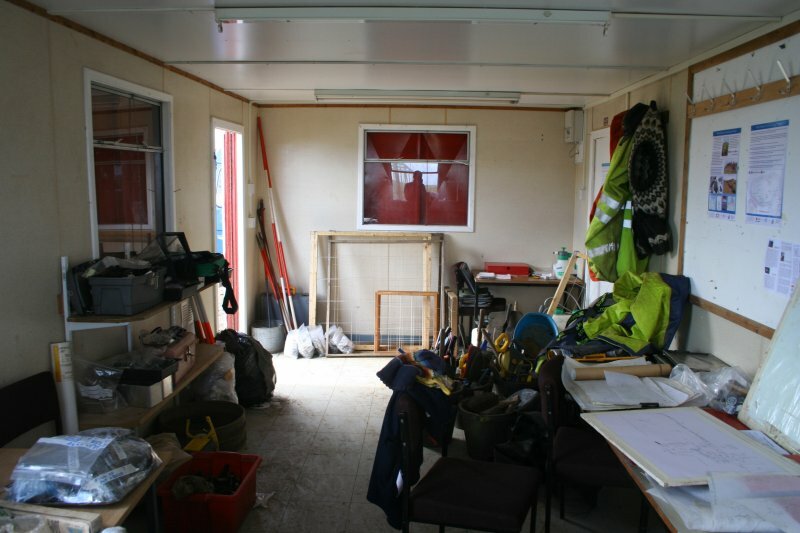 The structures report and diagrams can be found on the GUARD internet site, at http://www.guard.arts.gla.ac.uk/ 716index.htm. Sponsors: Historic Scotland, Clan Morrison Society, Comunn Eachdraidh Nis, Commhairle nan Eilean Siar. NB 5355 6501 Work was carried out in June 2002 on the tidal island of Dun Eisdean (NB56NW 01), to record any archaeological deposits prior to the construction of a steel footbridge across to the site. The island is believed to be the ancestral home of the Clan Morrison. Two trenches were opened, one on either side of the chasm dividing the island from the mainland of Lewis. 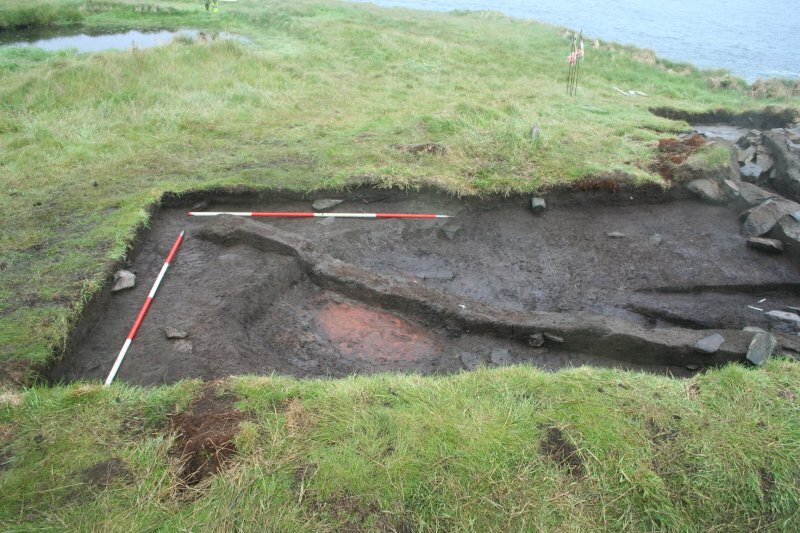 Trench 1 on the island measured 3.5 x 11.0m and ran from the edge of the island, over the main wall (structure H), and onto flat ground next to structure B (see DES 2001, 99-100). 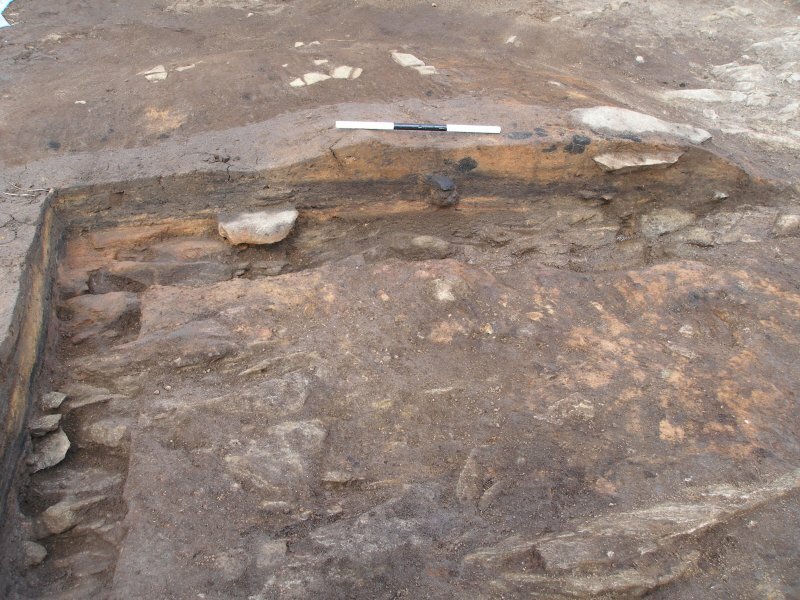 Over 300 sherds of local hand-made pottery were recovered from the southern half of this trench, as well as some iron slag and pieces of waterlogged wood. A lead pistol shot, measuring c 10mm in diameter, was also recovered. This had not been fired and retained its sprue. 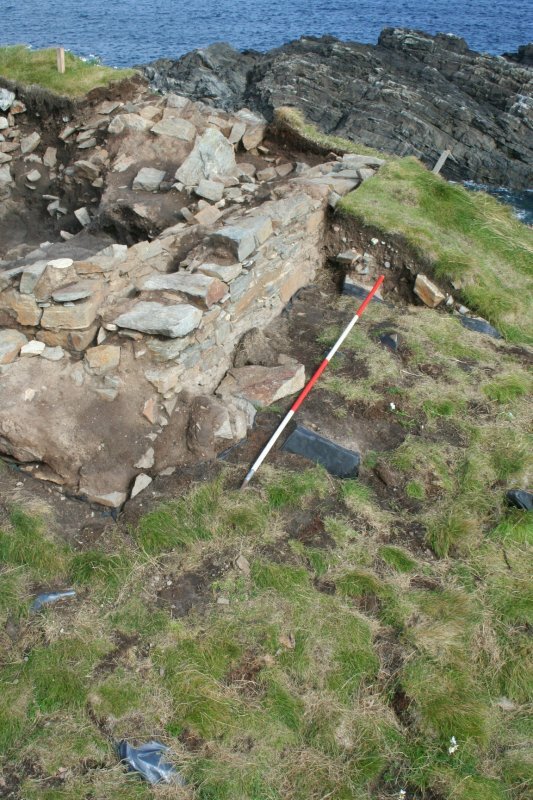 A 3.5m section of the main wall (structure H), which runs round the landward side of the island, was excavated and seen to be constructed of turf with stone facings. The external facings were intact to a height of just under 1m . The wall had collapsed inwards, the turf and earth core slumping over the majority of the trench. A further wall was revealed 3m to the N, running across the trench E-W. Although heavily robbed, it still retained two to three courses of masonry on either face for half of its length. It had a turf and earth core, and a gravel foundation. 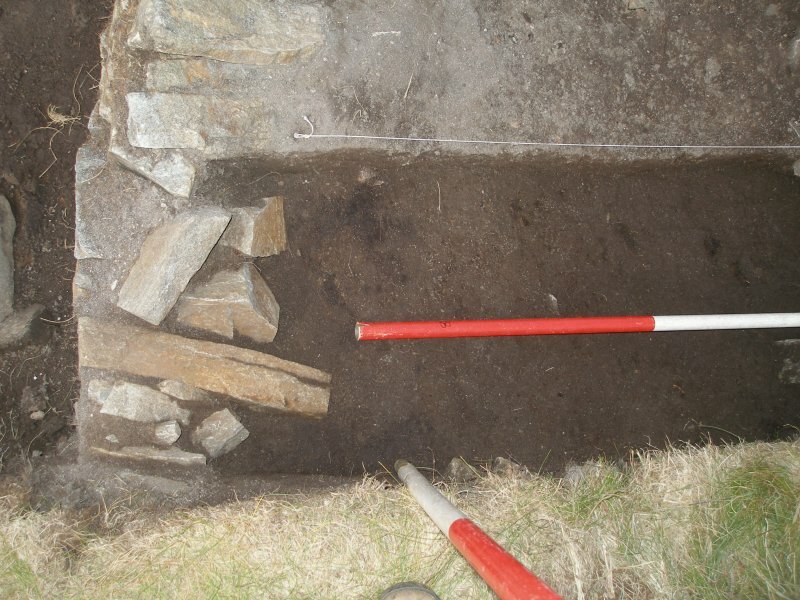 The wall may have accommodated a structural post, as a post-hole was revealed within a 0.5m gap in the wall. Four crude flint tools were recovered from its internal face. Between these two walls lay occupation deposits of pottery, waterlogged wood, and pieces of corroded iron. A number of beach pebbles were also strewn about. 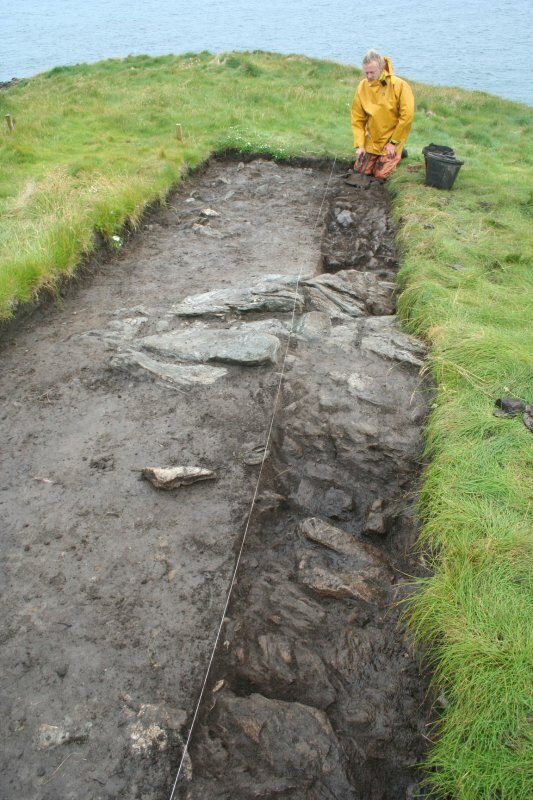 Trench 2 was situated on the mainland side, and measured c 15 x 11m. 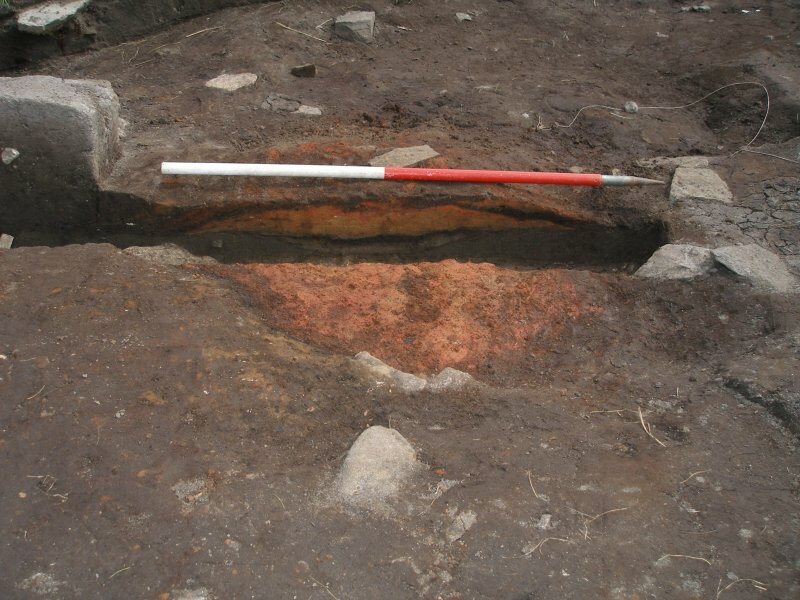 No significant features were found, and only two sherds of similar pottery and one flint artefact were recovered. Sponsors: Clan Morrison Society, Comunn Eachdraidh Nis, Commhairle nan Eilean Siar, Western Isles Enterprise. funded projects, which include documentary research, place-name analysis and the collection of oral traditions. 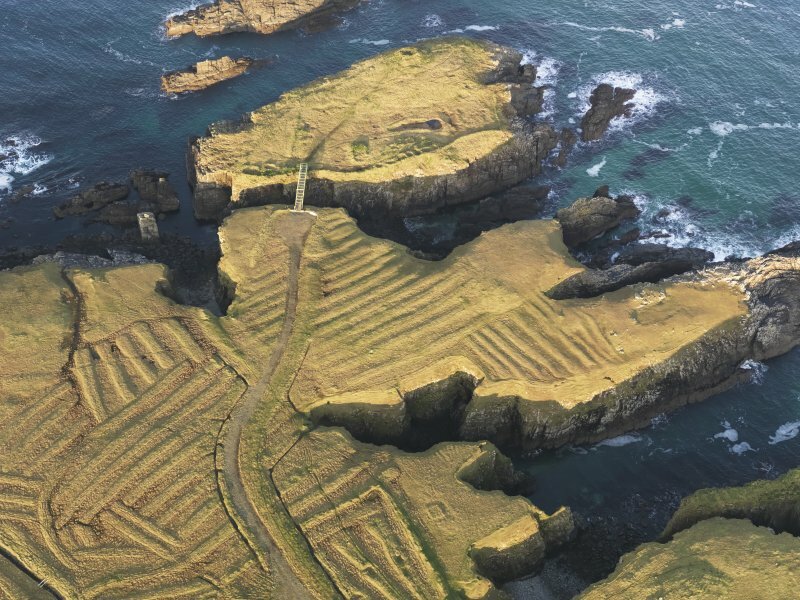 The project includes an archaeological survey of the N of Ness (the Ness Archaeological Landscape Survey) as well as the excavations and post-excavation work at Dùn Èistean. 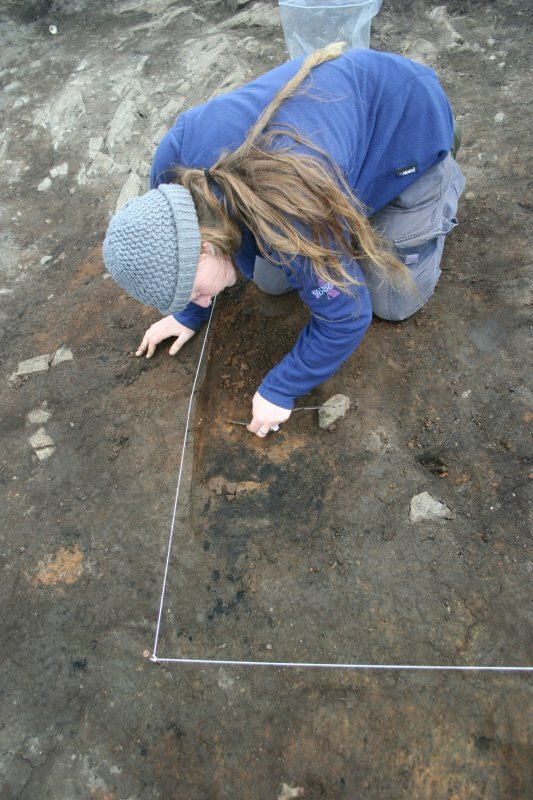 The first season of excavation was completed at the end of August 2005, and an extensive desk-based assessment has been completed of the NALS area, which has identified over 300 potential archaeological sites. 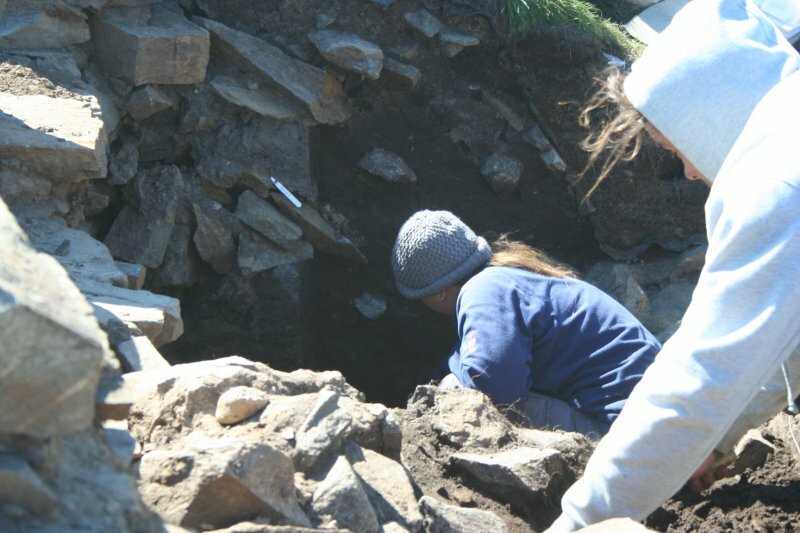 Both the survey and excavation aspects of the project incorporate local and student volunteers. 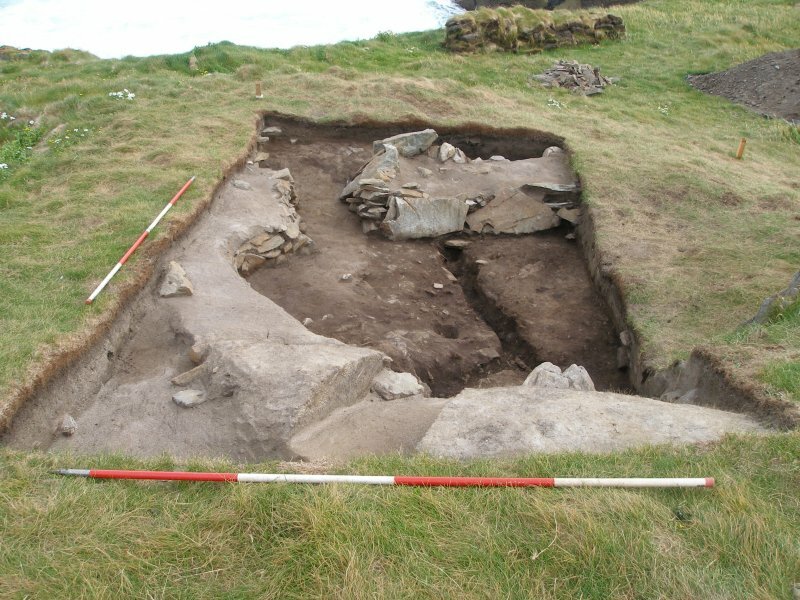 In July and August 2005, two large excavation areas were opened to investigate the largest rectangular building (Structure A) on the W side of the island and the dun (Structure G) at the NE, seaward side of the site. These ruins were all assessed in trial excavation trenches opened during previous work (DES 2001, 99-100; DES 2002, 119). 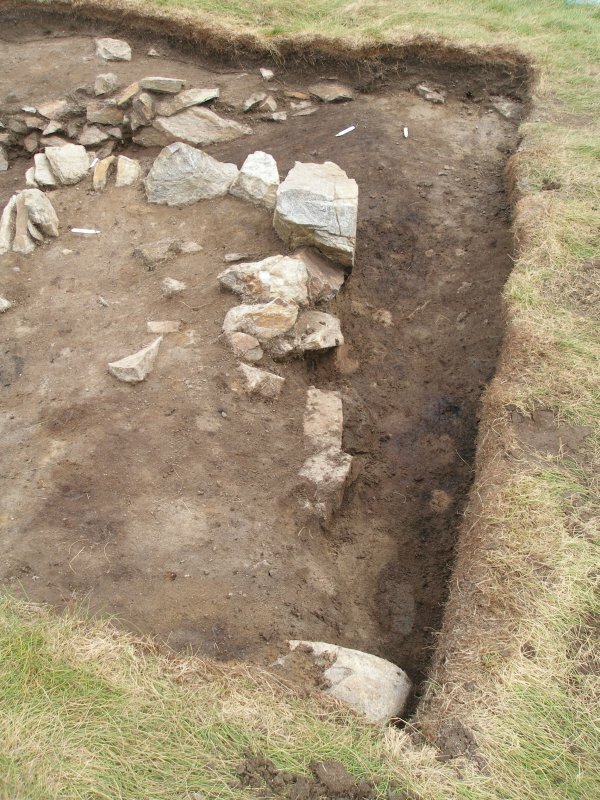 A smaller trench was also opened over the turf and stone wall (Structure H), but no excavation was undertaken below turf and topsoil removal. 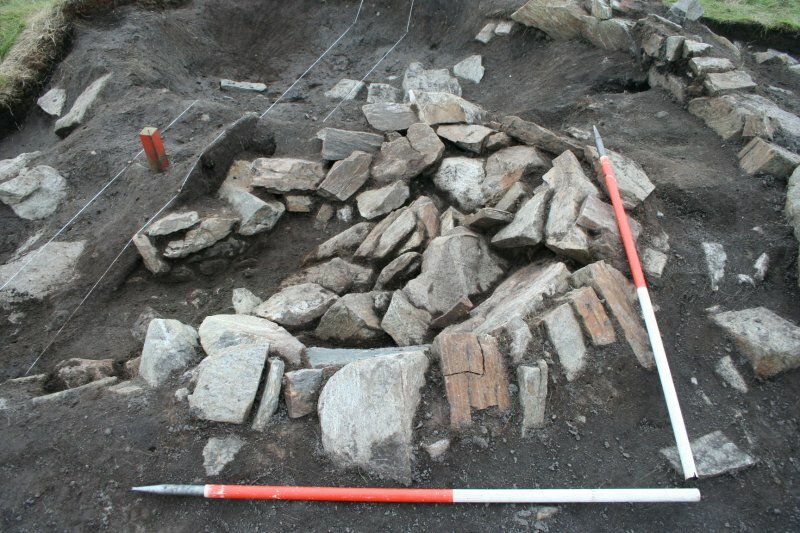 temporary shelter was built into the rubble at the N end of Room 1.
of core material, and was clearly built to carry a considerable load, and therefore height, of masonry. This structure will be investigated over the next two years, with the interior of the tower being the focus of the project next year. 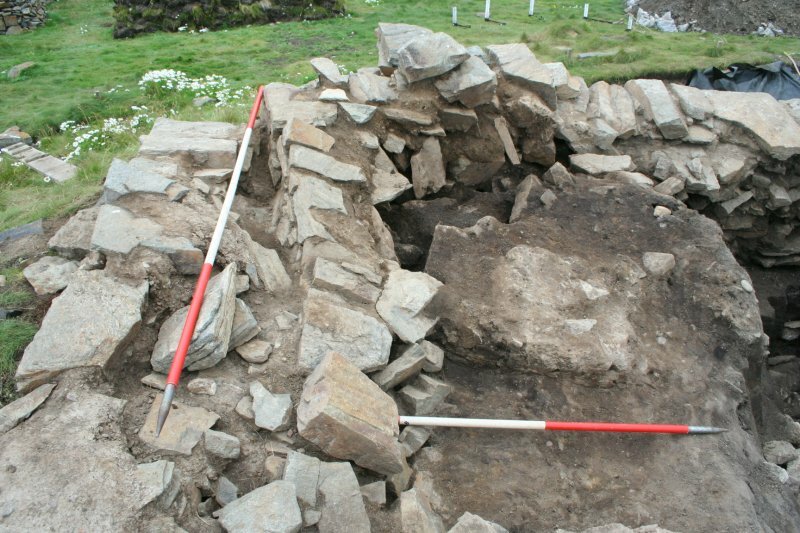 First indications are that it was built in one phase, and finds of a musket ball, flakes of flint and sherds of craggan indicate that, like Structure A, the tower dates to between the 16th and 18th centuries AD. 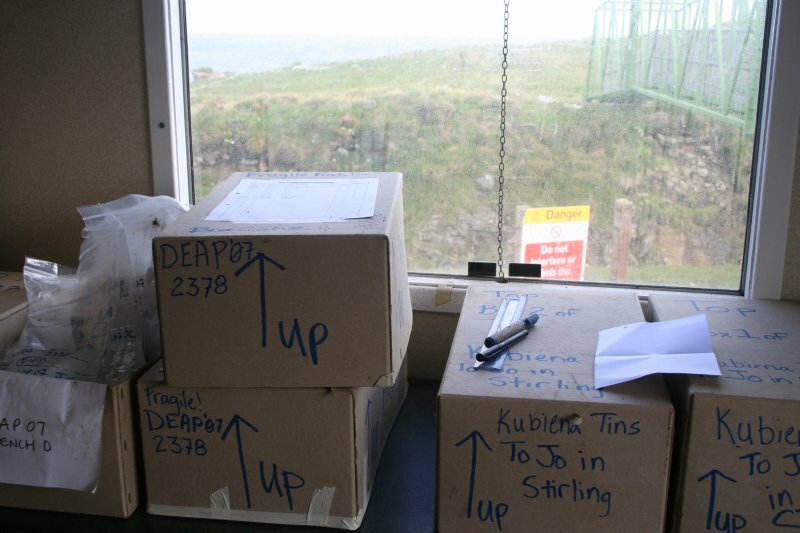 Archive to be deposited in Western Isles SMR and NMRS. Sponsors: HS, HLF, Comhairle nan Eilean Siar, Comunn Eachdraidh Nis, Comunn na Gàidhlig, Clan Morrison Society, University of Glasgow. 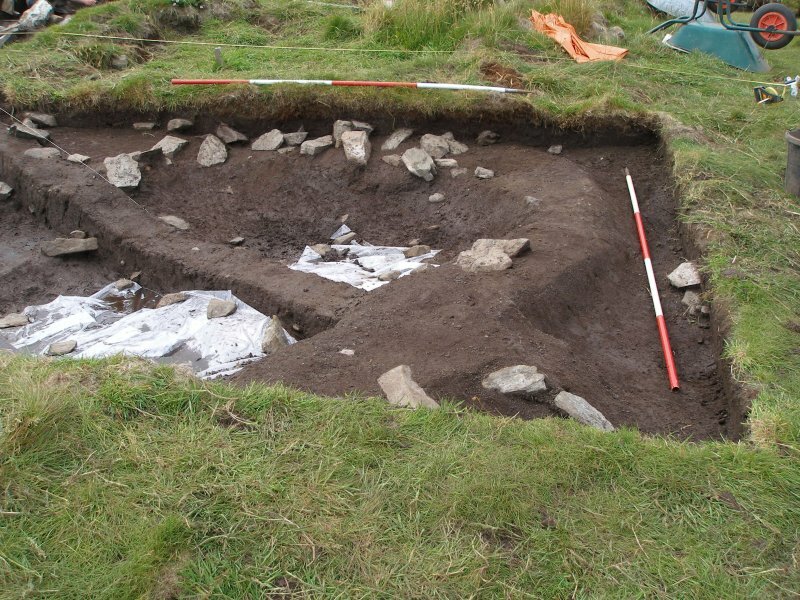 NB 5355 6501 This was the second of three seasons of excavation for the Dùn Èistean Archaeology Project (DEAP; see DES 2005, 144). 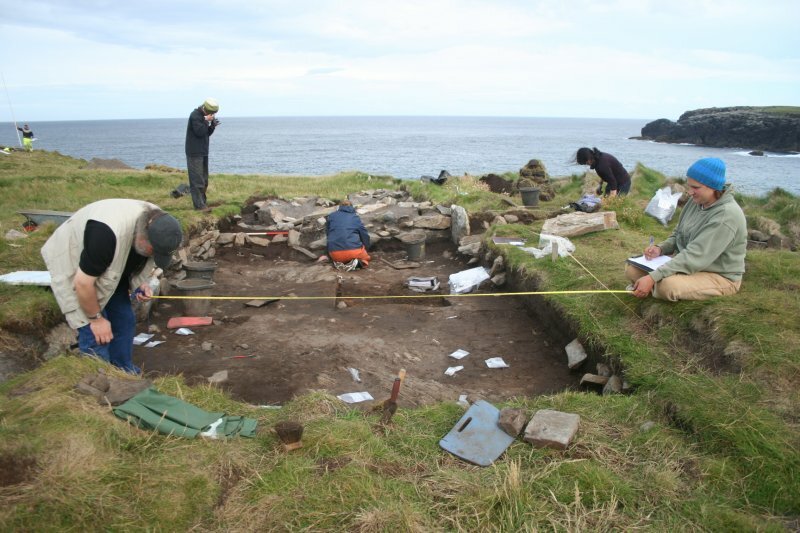 The project includes an archaeological survey of the N of Ness (the Ness Archaeological Landscape Survey, NALS) as well as the excavations and post-excavation work at Dùn Èistean. 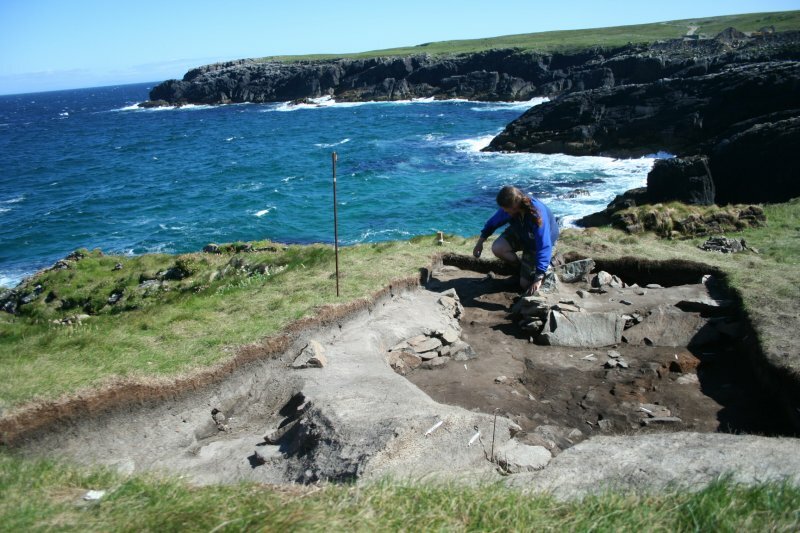 The first season of excavation on Dùn Èistean was completed at the end of August 2005. 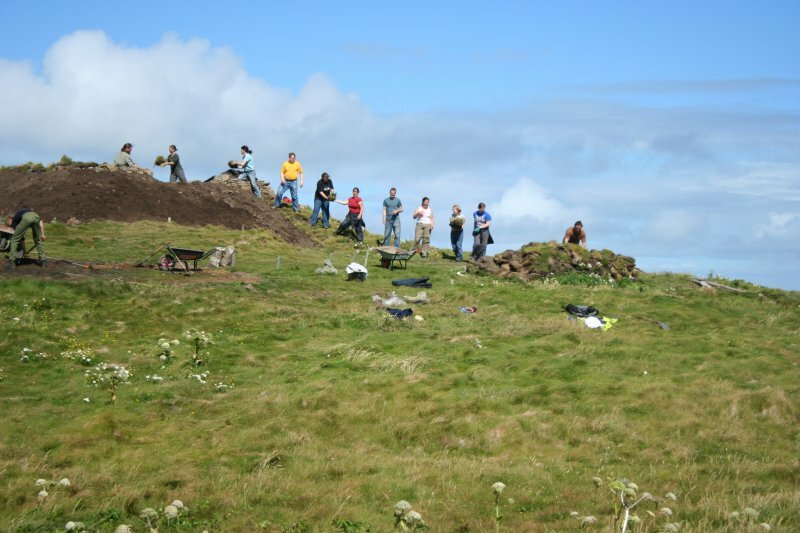 Both the survey and excavation use local and student volunteers, and as much post-excavation processing and other back-up, such as leaflet production and web-site maintenance, is undertaken locally in Ness at the Comunn Eachdraidh. 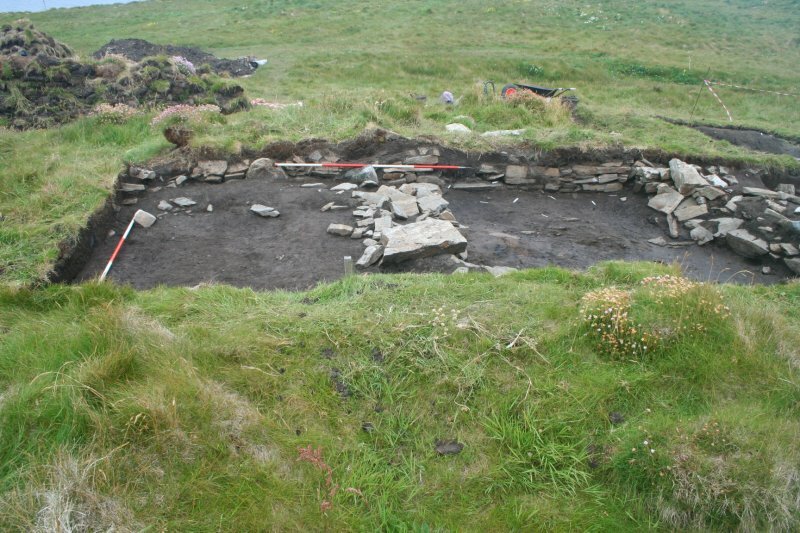 Between 3 July and 10 August 2006 three large excavation areas were opened to investigate the two groups of cellular buildings, Structures B and D, built against the perimeter wall on the S side of the stack, and the tower structure partially excavated in 2005, Structure G at the NE, seaward side of the site. 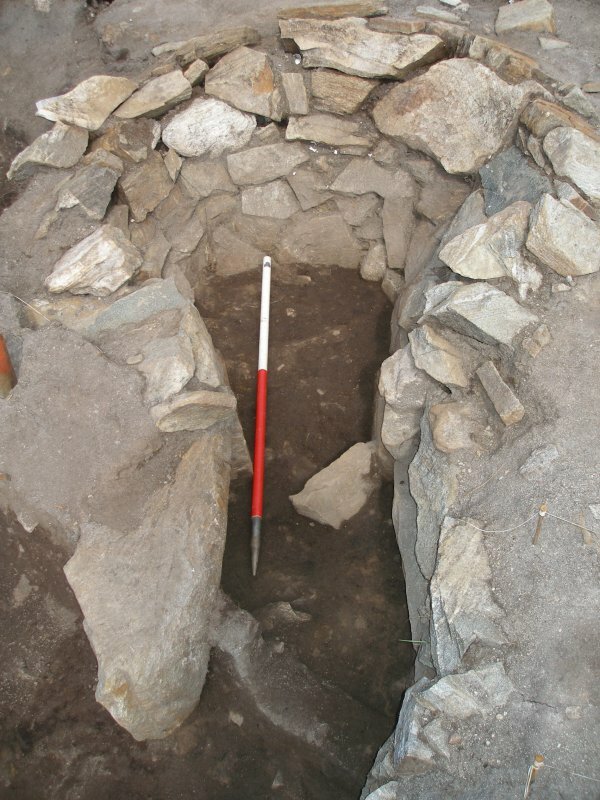 Structures D and G had been assessed in small 1m-wide trial excavation trenches opened during previous work in 2001 (DES 2001, 99-100). The earliest deposits encountered in Trench B were the remains of old ground surfaces and topsoils, and hearth and occupation deposits. This earlier phase of occupation had been largely destroyed by the building of later structures B4, B5 and B1, built from conjoining walls with earth cores and stone faces of unmortared stone. 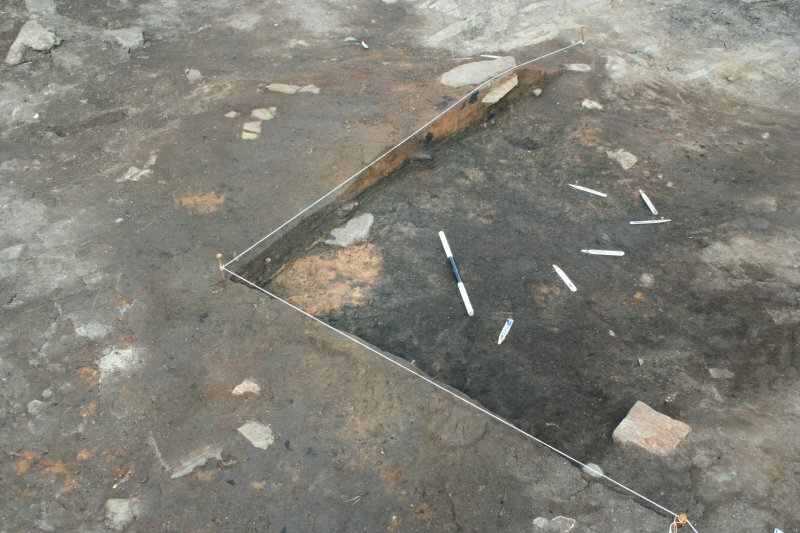 Structures B4 and B5 had sunken floors, and no hearths or other interior features, although an occupation deposit filled the sunken floor of B5, and Structure B6 was larger, sub-rectangular and had slightly bowed sides, but no interior features evident. 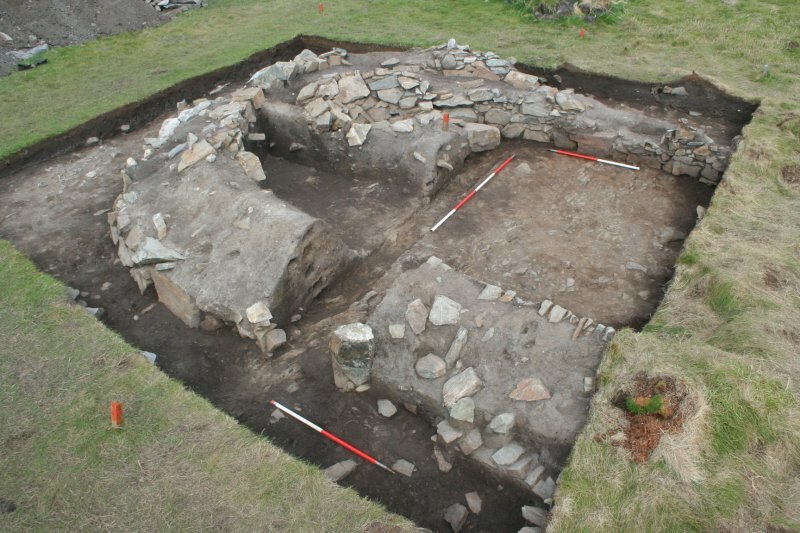 To the N and separated from these buildings by a gap of around am, was the largest of the structures within the trench - Structure B1, with a sunken floor, and a central hearth. 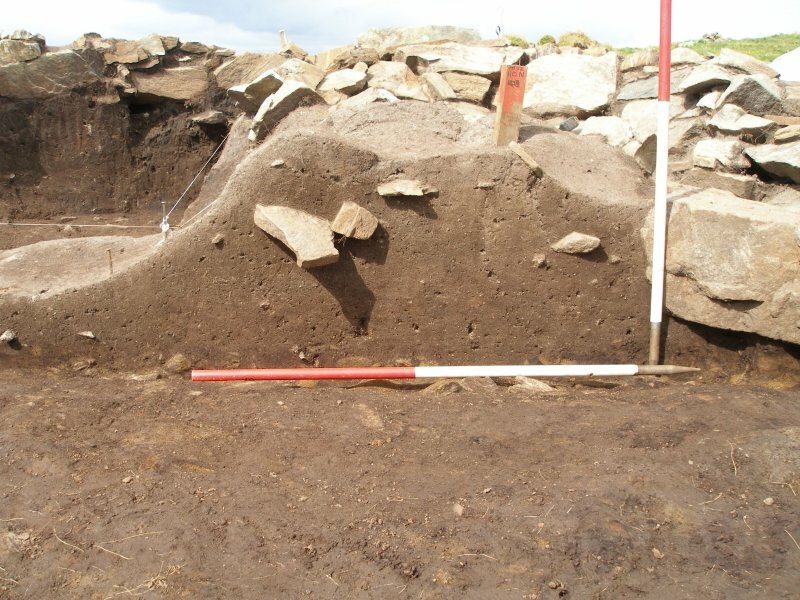 Adjacent to it, at a gap in the perimeter wall, Structure H, lay an old entrance on to the stack at the corner of a triangular enclosure bounded by Structures B, A and H. Finds of cragan sherds, pieces of slag and iron, flint and bone fragments from the ash and occupation levels from the earlier occupation below the structures, are evidence of domestic occupation and possible domestic metalworking. Finds from the occupation and construction of the buildings themselves comprised mostly coarse ceramic sherds, with occasional finds of worked quartz, iron objects, gun flints and worked flint. 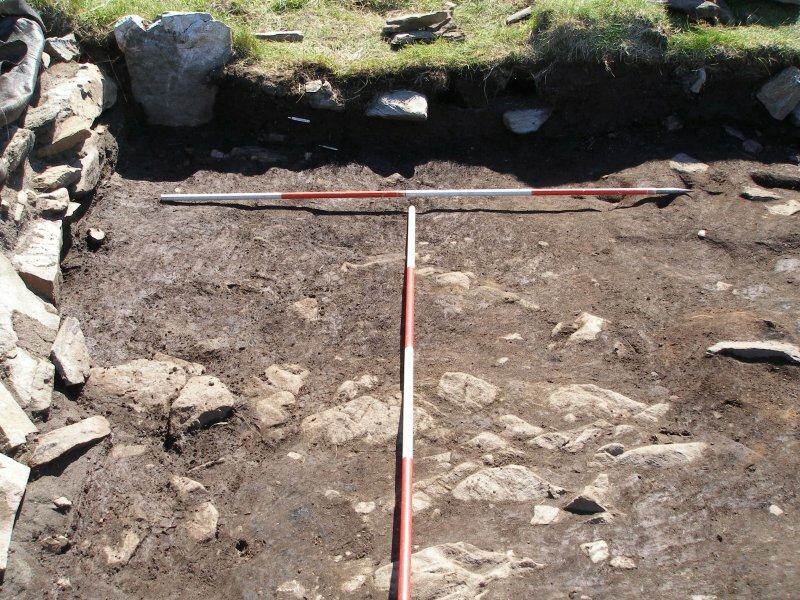 The finds all reflect a broadly domestic use for the buildings, although the consistent finds of gunflints and pistol shot suggest episodes of conflict. 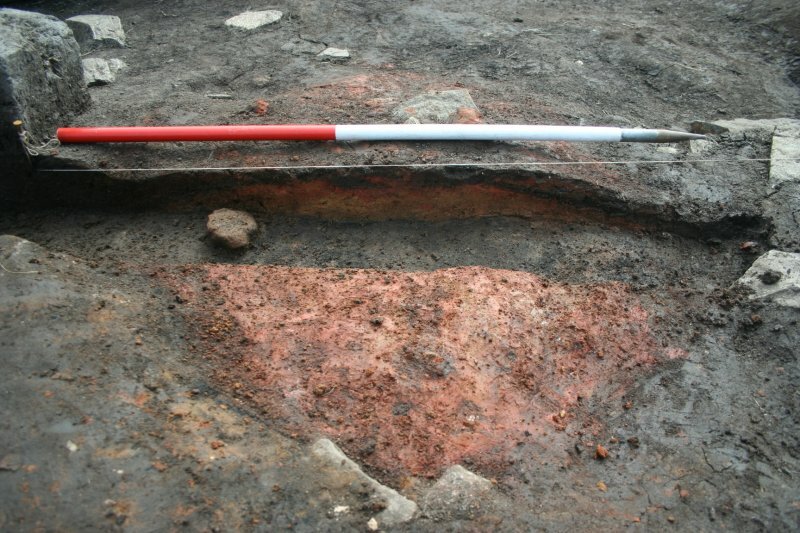 Above the structures lay several layers of collapse and abandonment, from which artefacts broadly datable to the late 16th/early 17th to 19th centuries were recovered, the earlier range being represented by an Elizabethan silver sixpence, dating to 1570 or 1580, pistol shot and glazed ceramics. 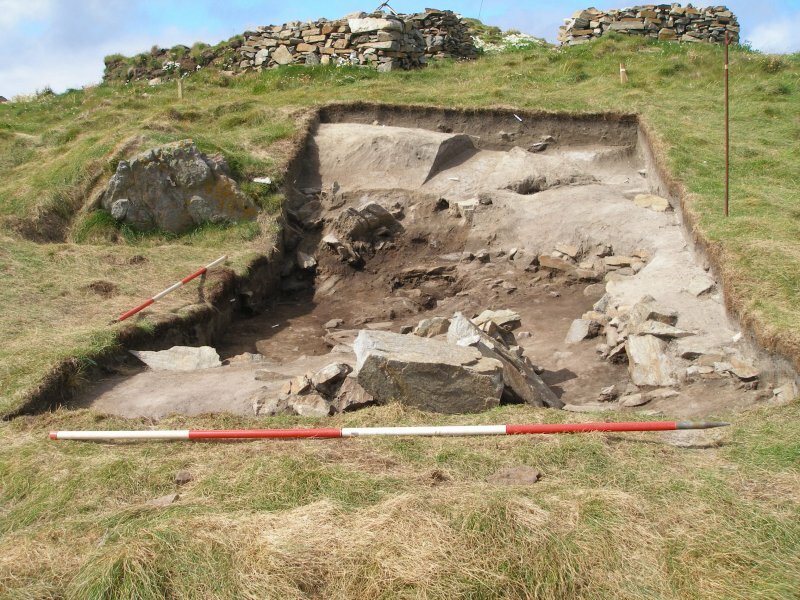 Trench D was only partially excavated in 2006 and most of the excavation involved the removal of layers of turf slump collapse from a series of small turf- and stone-built structures, Structures D4, D8, D13 and D14, much like shieling huts. 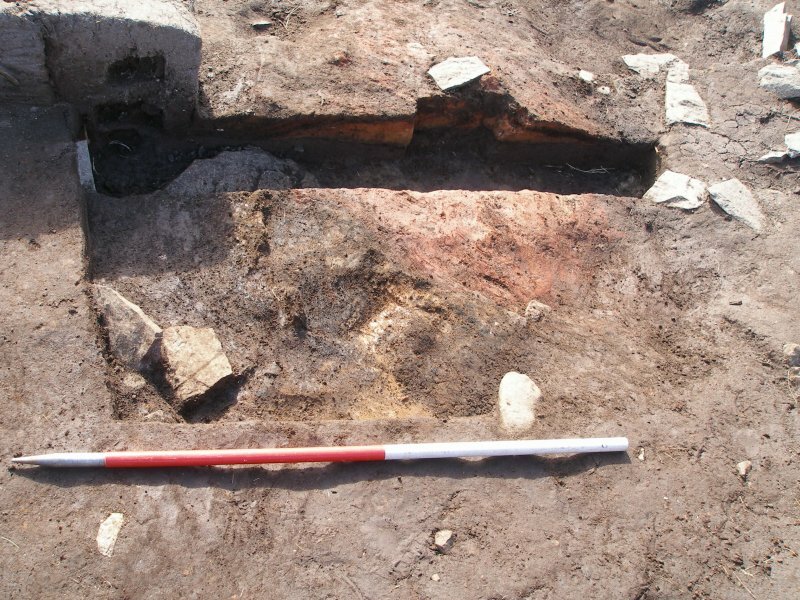 These buildings were investigated thoroughly with the excavation of all internal features and partial investigation of walls by sondage, and several phases of occupation and re-use were evidenced. 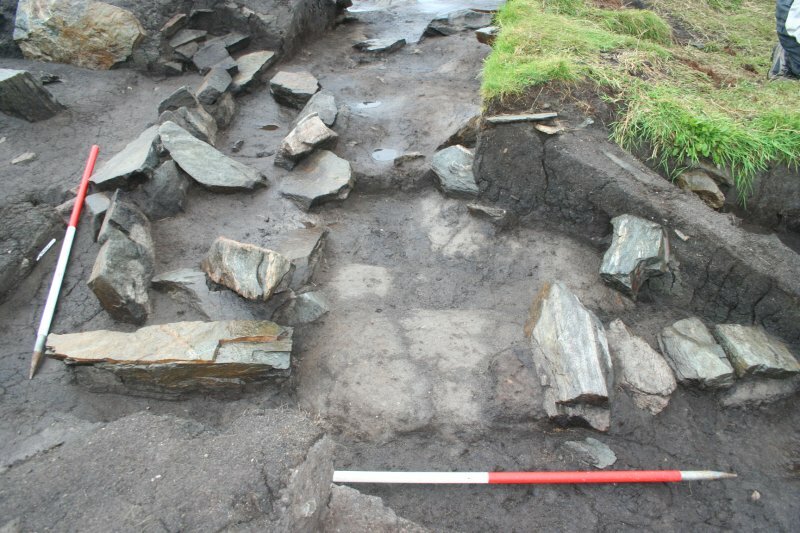 Two of the buildings (Structures D7 and D8) had central hearths, suggesting that they may have been used for occupation, although the larger (unexcavated) hearth noted in Structure D7 suggests a possible industrial use than the simple sub-rectangular one seen in Structure D8. 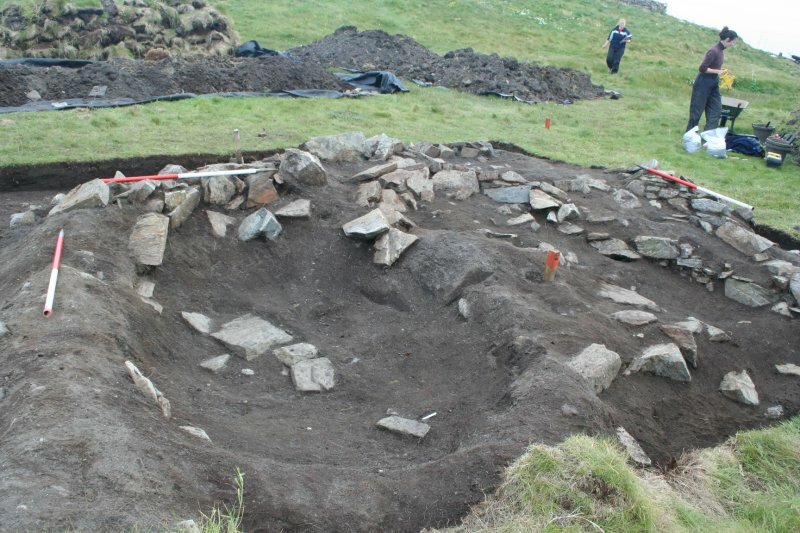 Structures D13 and D14 had no hearths and may have been used for storage. 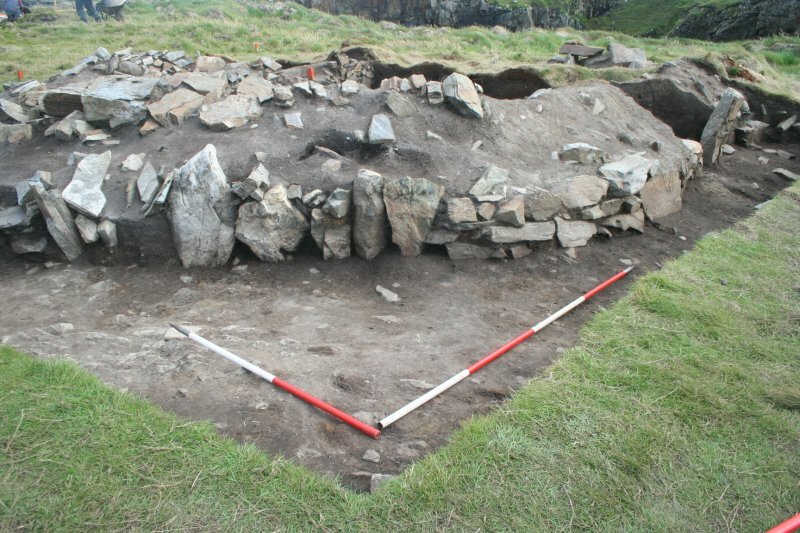 Structure D4 lay mostly outside the excavated area and as a result no internal features were identified. 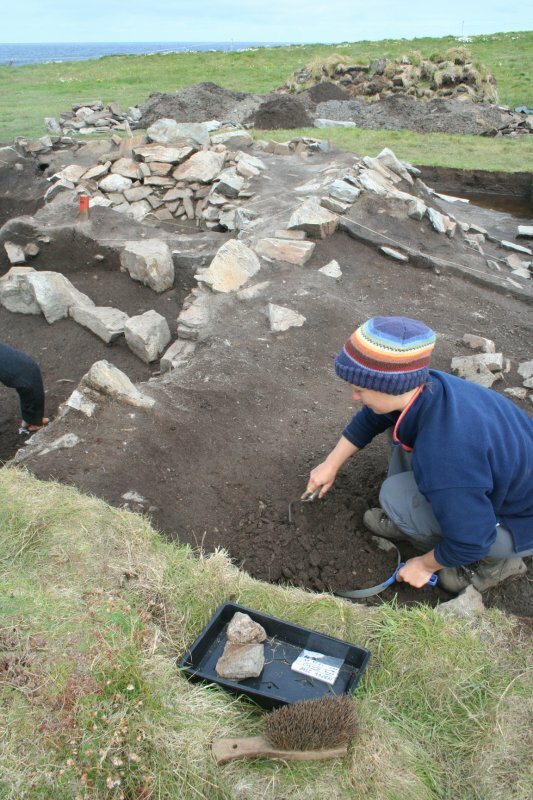 Below the later buildings to the N of D10 was found a rectangular building, with a doorway in the N wall and evidence internally of occupation in the form of a large central hearth and a pottery-rich occupation layer. 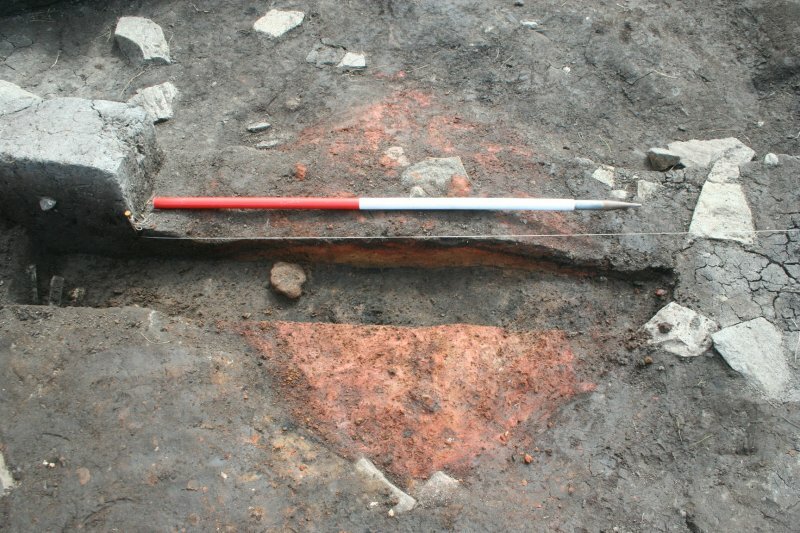 The corner of a second building on the same alignment was also uncovered but not excavated. 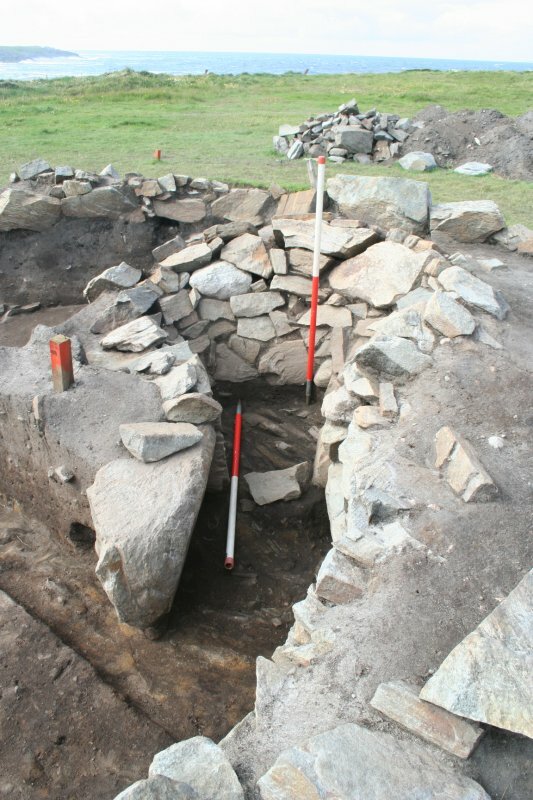 Comparisons can be made with Structure A, a rectangular structure with turf core walls and stone facings excavated in the 2005 DEAP season, and with Structure B1 excavated in 2006. 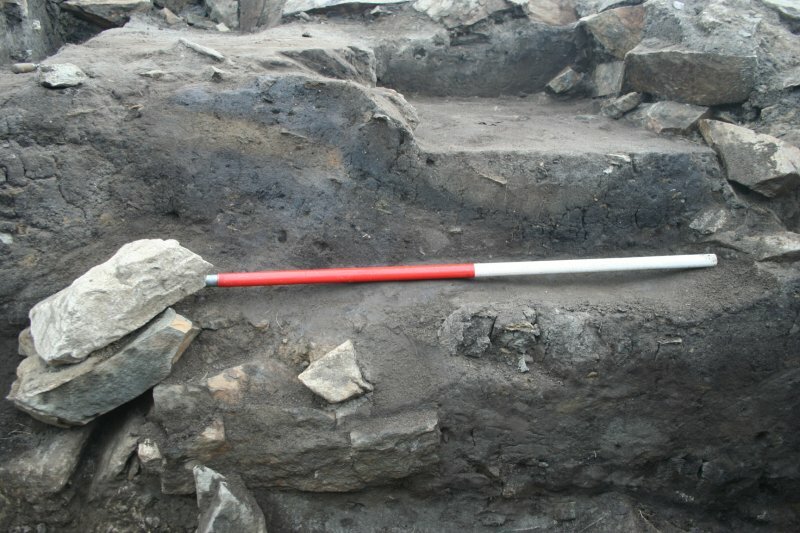 Locally-made, hand-built coarse Cragan-ware pottery, peat-ash, stone robbed from earlier structures, and charcoal were all found within the slump and cores of the turf walls of the later shieling-type structures, indicating that they had been cleared out and repaired several times, possibly as a result of occupation and re-use on a seasonal basis. 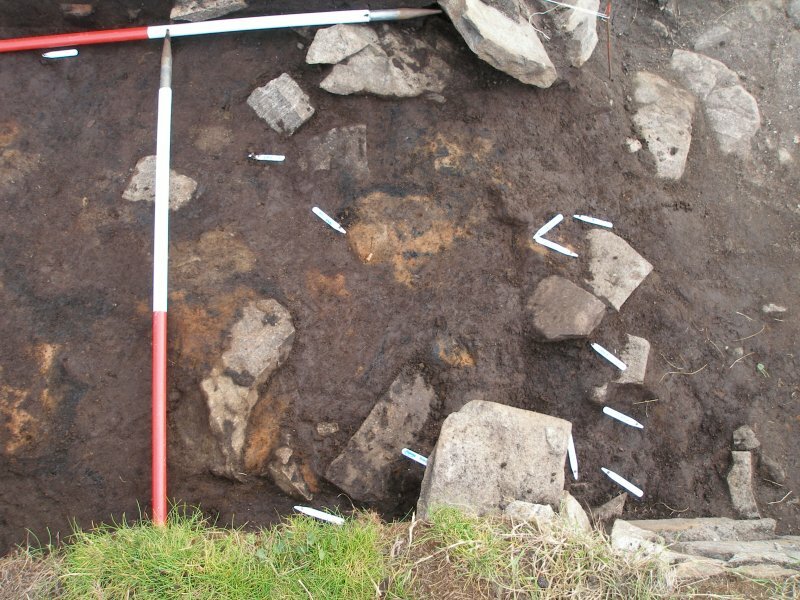 The mixed assemblage of finds from the these turf structures in Trench D is largely domestic in nature, and includes a possible pot hook, burnt animal bone, sherds of coarse pottery, corroded iron objects, a lump of slag, and a crucible fragment. A gun flint is the only find that is not domestic in nature. 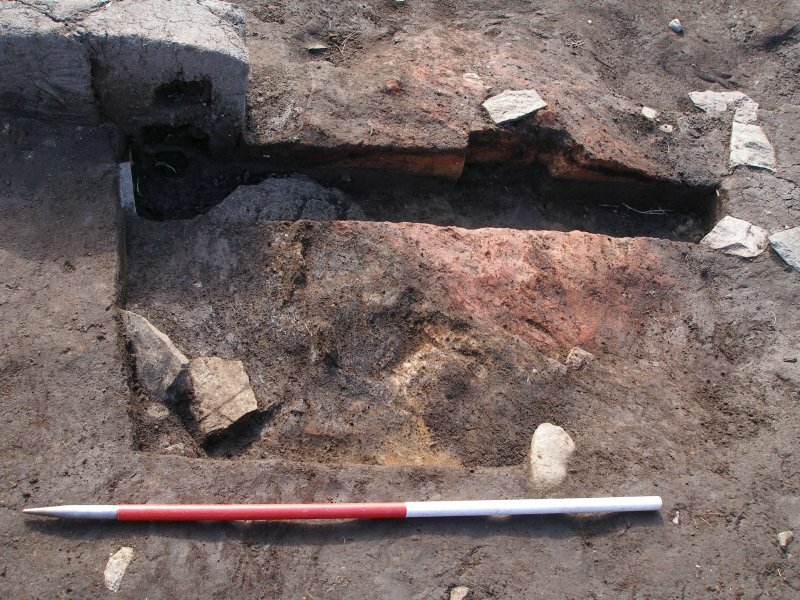 A large assemblage of sherds of coarse pottery, including decorated sherds, were recovered from deposits associated with the earlier rectangular buildings, retrieved mainly from midden and occupation layers. 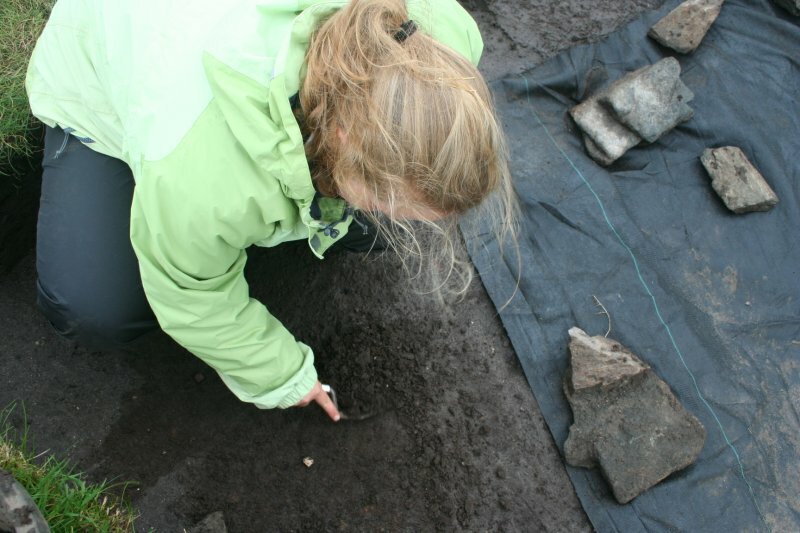 Burnt bone was a frequent find, reflecting cooking activity on the site, particularly in the hearths excavated. Other finds recovered are of the same range as those found in the collapse layers above - worked and flaked flint, a gun flint, sherds of post-medieval glass, fire-cracked stone, iron objects, worked quartz and slag. 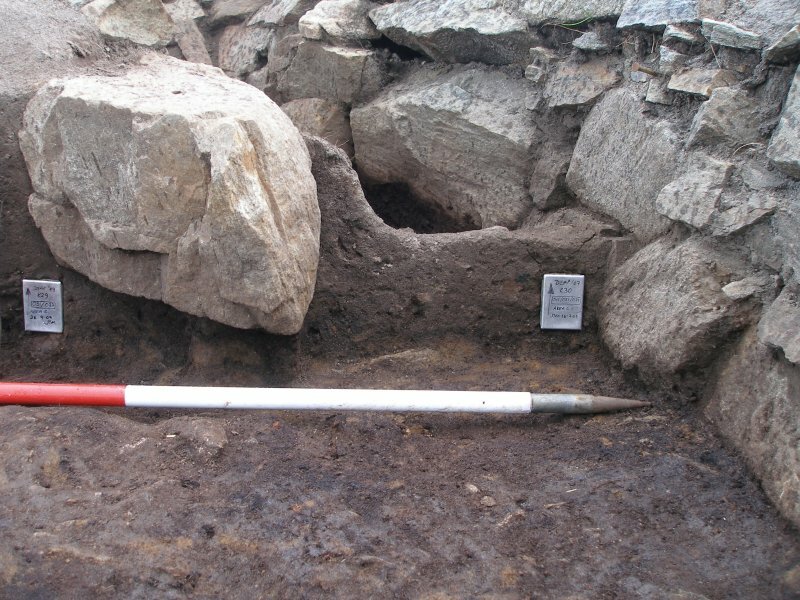 Excavations in Trench G continued from 2005, when the first indication of an interior face for the ruined tower was uncovered, giving a possible overall thickness of up to 2m for the base of the tower wall. The wall incorporated around 1m of core material, and was clearly built to carry a considerable load and therefore height of masonry. In 2006 the excavation focused on the interior of the tower, and on clearing one corner of the exterior collapse so as to assess the condition of the structure for possible future conservation or consolidation work. 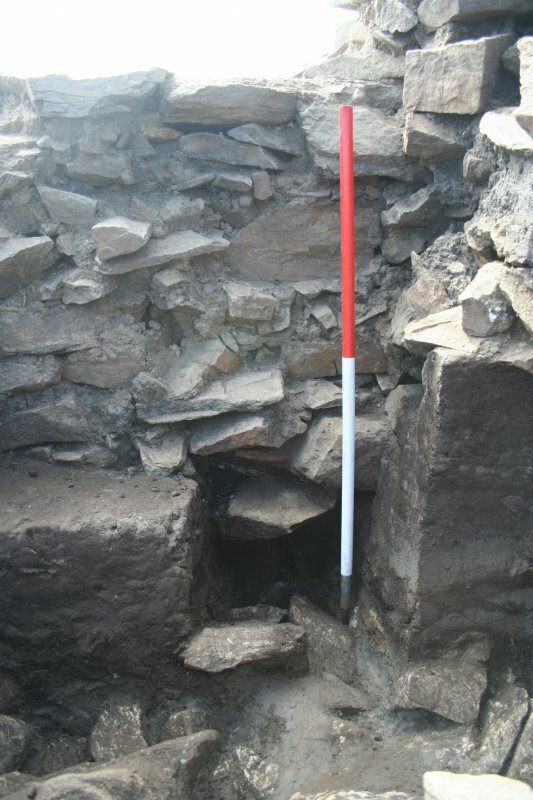 A trench dug by antiquarian Rev M MacPhail in 1866 into the interior of the tower was emptied, and had been excavated down to the natural subsoil and bedrock within the tower. Excavation of the collapse at the SW corner of the tower revealed that remains of the original ground surface survive, and also patches of clay dropped during the original construction of the tower. 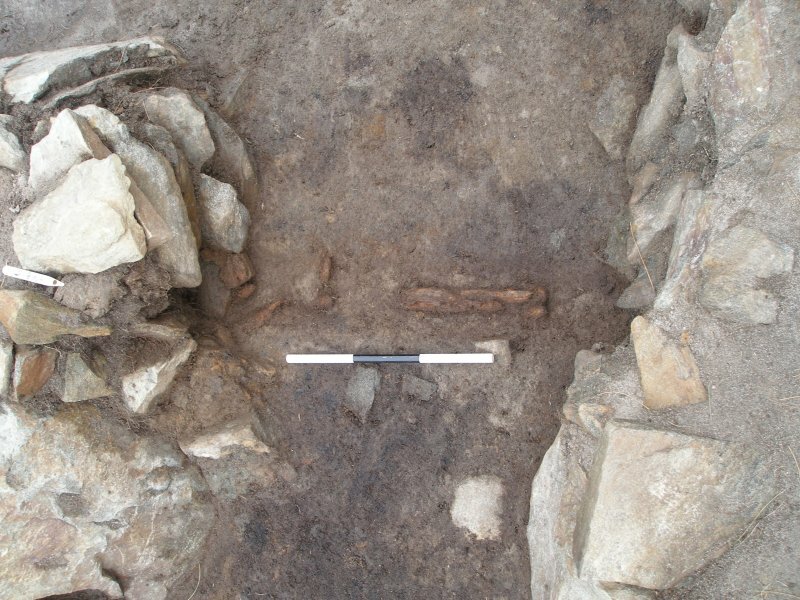 Finds of a musket ball, gun flint and flakes from the collapse around the tower indicate conflict on the site, although sherds of coarse pottery and bone are evidence of periodic, short-lived shelter in the structure between the 16th and 18th centuries AD. Archive lodged with NMRS and SMR (intended); Museum nan Eilean (intended). Sponsors: Heritage Lottery Fund; Historic Scotland; Comhairle nan Eilean Siar; Comunn Eachdraidh Nis; Comunn na Gàidhlig; Clan Morrison Society; Glasgow University. NB 5355 6501 Work was carried out in May 2000 and May and June 2001 on the tidal island of Dun Eistean (NMRS NB 56 NW 01). 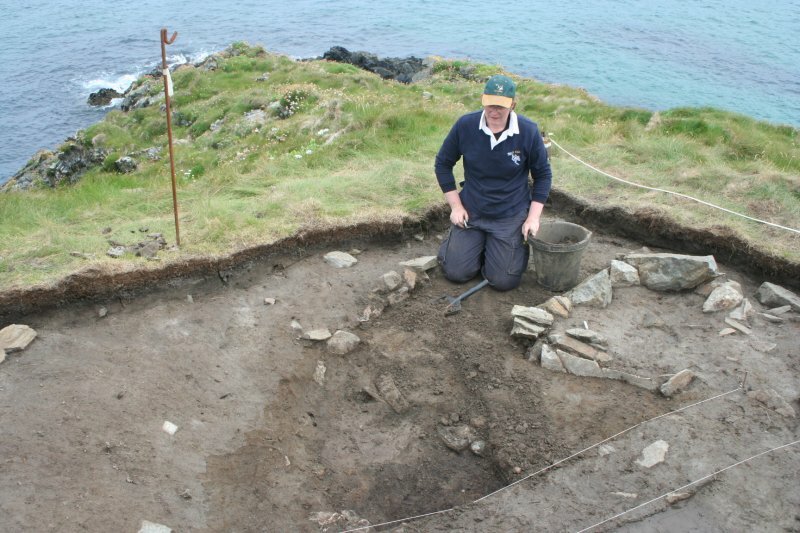 This represented the initial stage of a long-term project to investigate the archaeology on the island. The island is believed to be the ancestral home of the Clan Morrison. 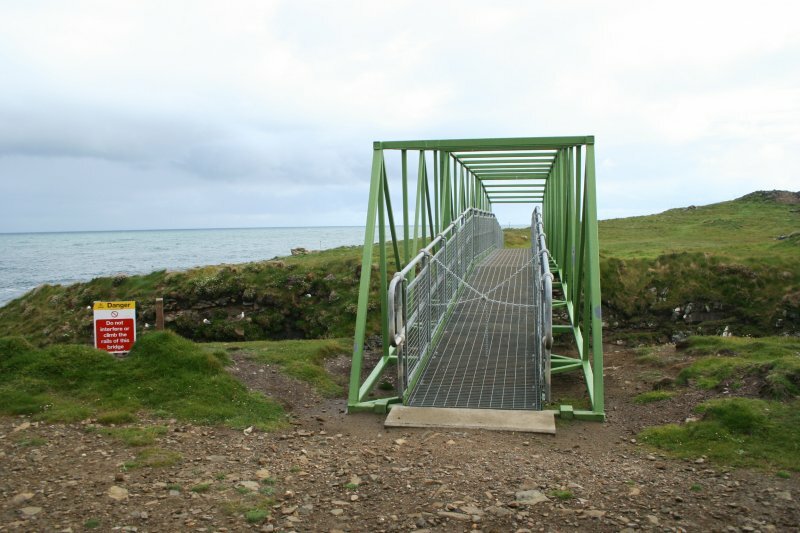 NB 5355 6501 Work was carried out in June 2002 on the tidal island of Dun Eisdean (NB 56 NW 01), to record any archaeological deposits prior to the construction of a steel footbridge across to the site. The island is believed to be the ancestral home of the Clan Morrison. 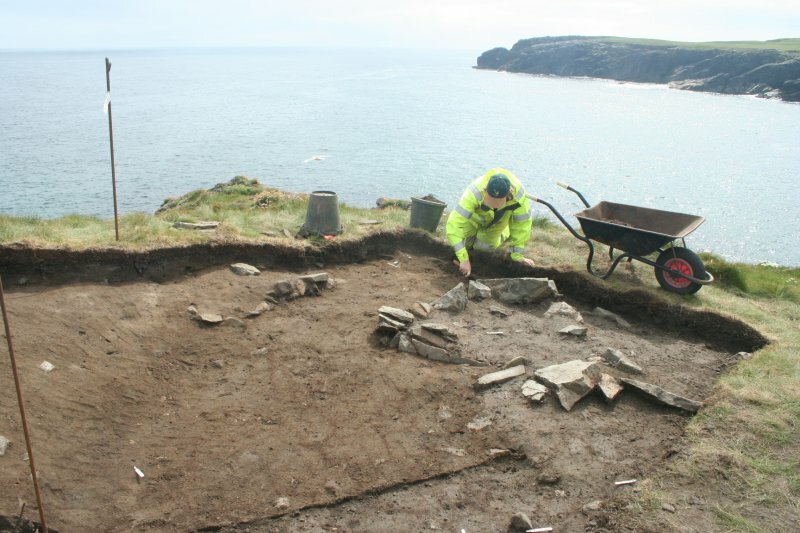 Fortified settlement on sea stack NB 5355 6501 The Dùn Èistean Archaeology Project is a multidisciplinary field project running for three years, drawing on previous work (DES 2002, 119) and also the results of a series of separately funded projects, which include documentary research, place-name analysis and the collection of oral traditions. 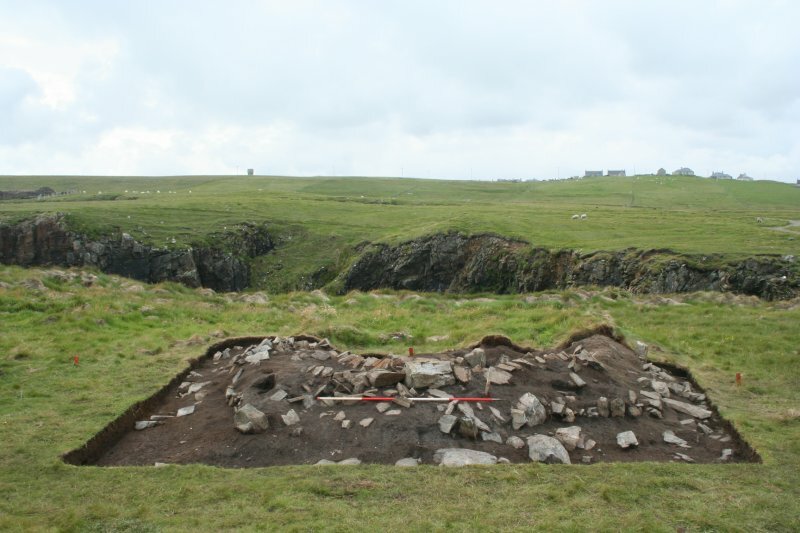 The project includes an archaeological survey of the N of Ness (the Ness Archaeological Landscape Survey) as well as the excavations and post-excavation work at Dùn Èistean. 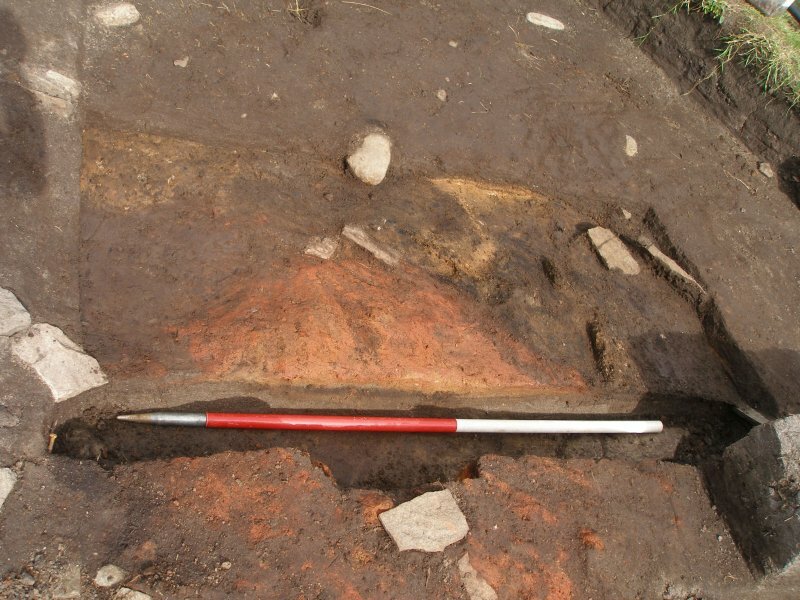 The earliest deposits encountered in Trench B were the remains of old ground surfaces and topsoils, and hearth and occupation deposits. This earlier phase of occupation had been largely destroyed by the building of later structures B4, B5 and B1, built from conjoining walls with earth cores and stone faces of unmortared stone. 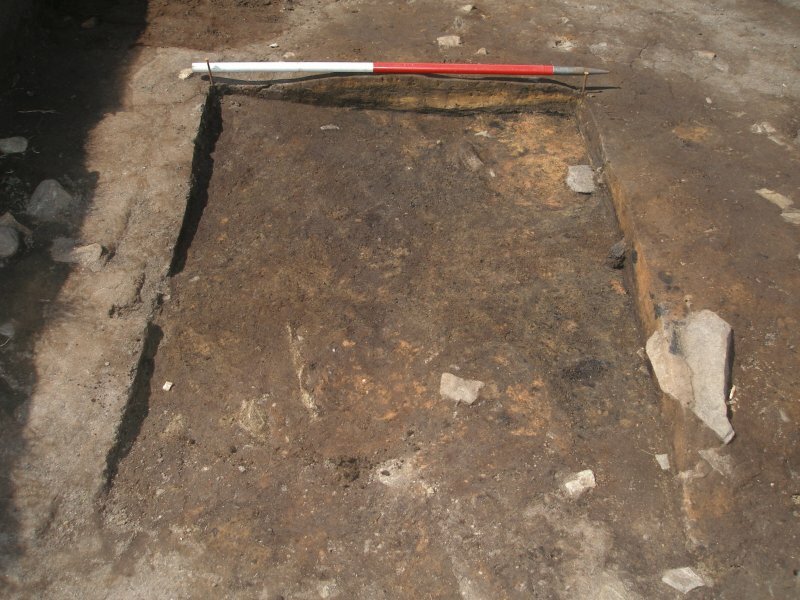 Structures B4 and B5 had sunken floors, and no hearths or other interior features, although an occupation deposit filled the sunken floor of B5, and Structure B6 was larger, sub-rectangular and had slightly bowed sides, but no interior features evident. 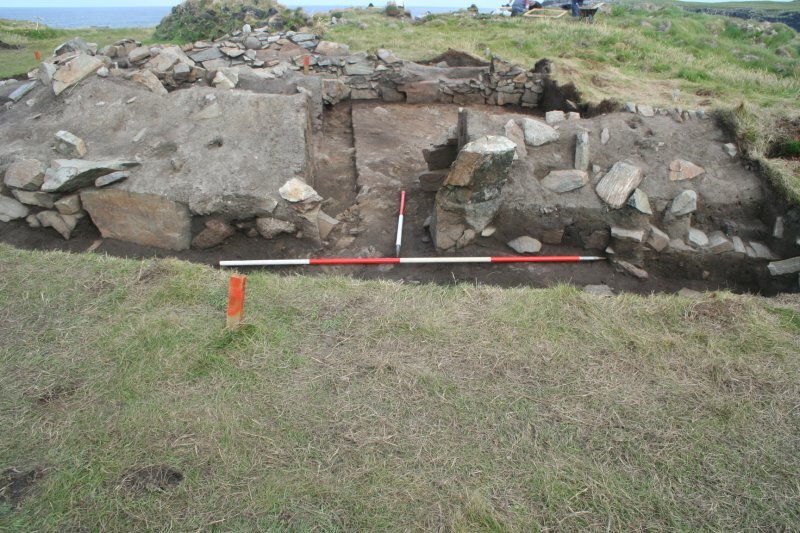 To the N and separated from these buildings by a gap of around am, was the largest of the structures within the trench ' Structure B1, with a sunken floor, and a central hearth. 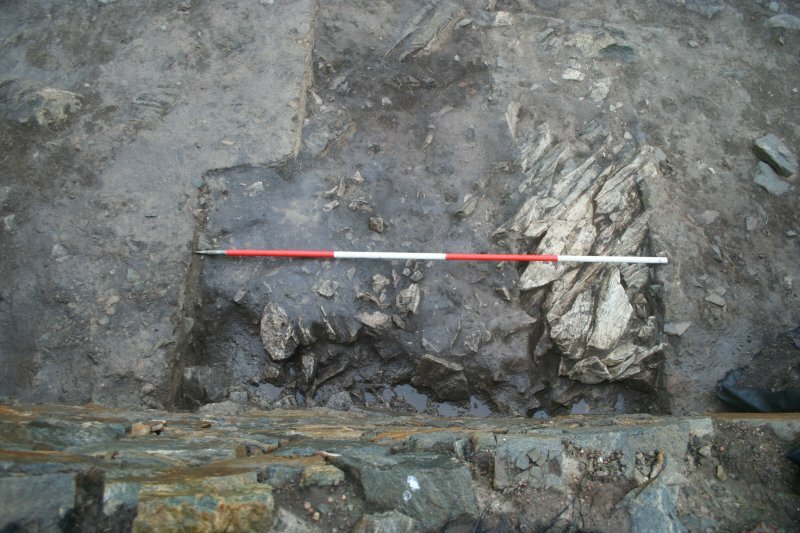 Adjacent to it, at a gap in the perimeter wall, Structure H, lay an old entrance on to the stack at the corner of a triangular enclosure bounded by Structures B, A and H. Finds of cragan sherds, pieces of slag and iron, flint and bone fragments from the ash and occupation levels from the earlier occupation below the structures, are evidence of domestic occupation and possible domestic metalworking. Finds from the occupation and construction of the buildings themselves comprised mostly coarse ceramic sherds, with occasional finds of worked quartz, iron objects, gun flints and worked flint. 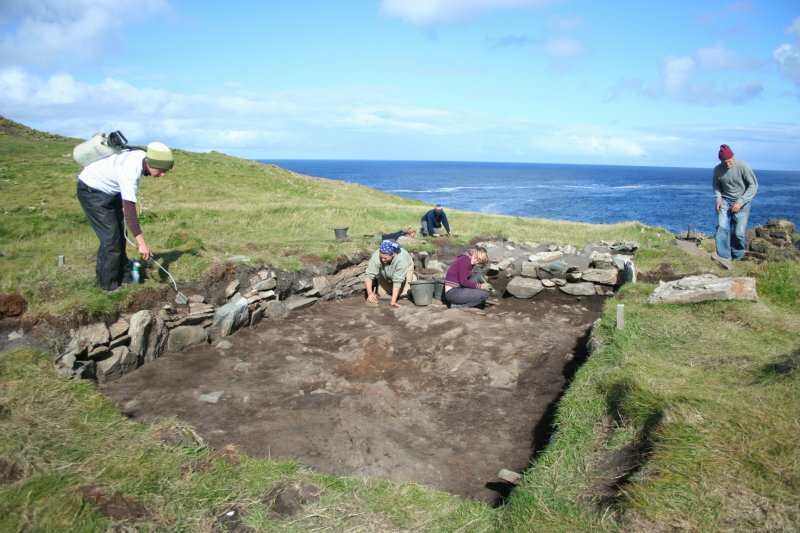 The finds all reflect a broadly domestic use for the buildings, although the consistent finds of gunflints and pistol shot suggest episodes of conflict. 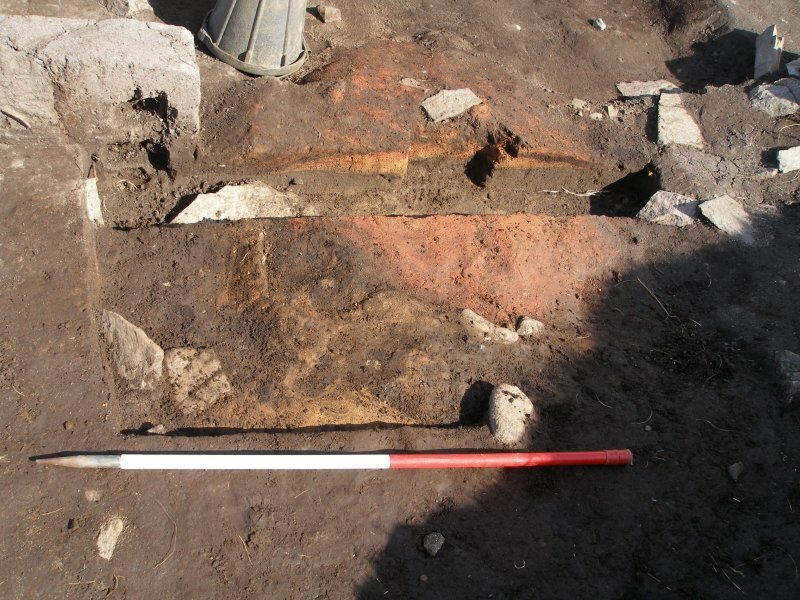 Above the structures lay several layers of collapse and abandonment, from which artefacts broadly datable to the late 16th/early 17th to 19th centuries were recovered, the earlier range being represented by an Elizabethan silver sixpence, dating to 1570 or 1580, pistol shot and glazed ceramics. 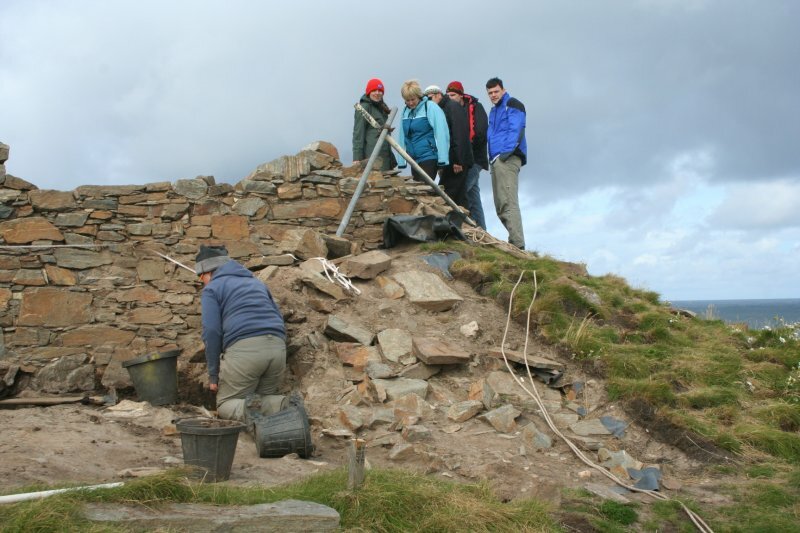 NB 5355 6501 In March 2005 the Dùn Èistean Archaeology Project (DEAP) committee commissioned us to undertake and manage the DEAP, a multi-disciplinary field project centred on the small island site of Dùn Èistean in Ness on the NE coast of the Isle of Lewis. We had undertaken three previous seasons of work of topographic and geophysical survey and trial trenching at the site in 2000–02, and DEAP was built on the results of this work. 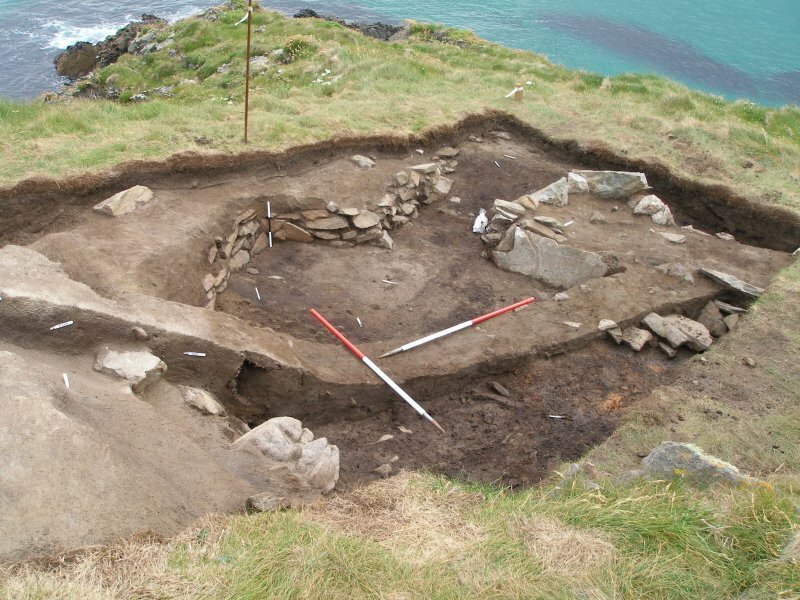 Excavation on Dùn Èistean represents only one half of the project, the other being the Ness Archaeological Landscape Survey, NALS, which aims to survey and record the archaeology of Ness from the earliest prehistoric remains to 1950s. 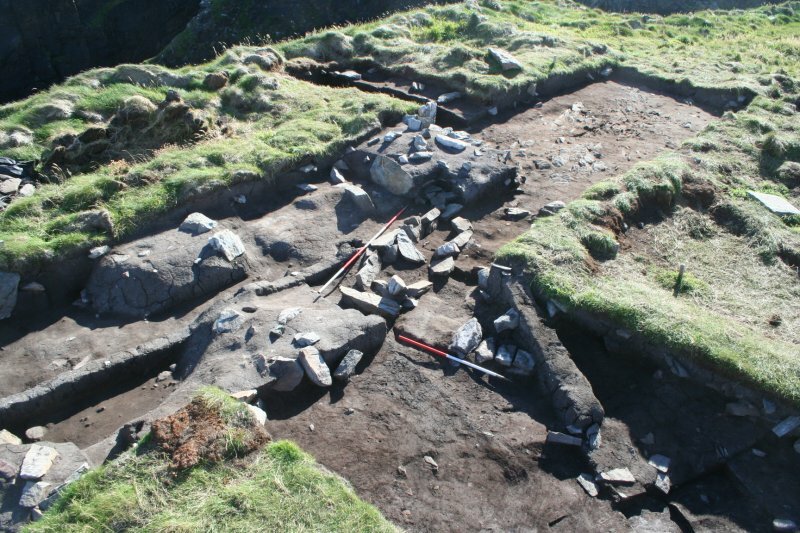 This report describes the results of the third and final season of excavation on Dùn Èistean, undertaken over six weeks between 25 June–2 August 2007. Professional archaeologists worked alongside local and student volunteers on the excavation, and environmental processing and web site maintenance were undertaken in the local community at the Comunn Eachdraidh Nis (Ness Historical Society) whilst the excavation was ongoing. 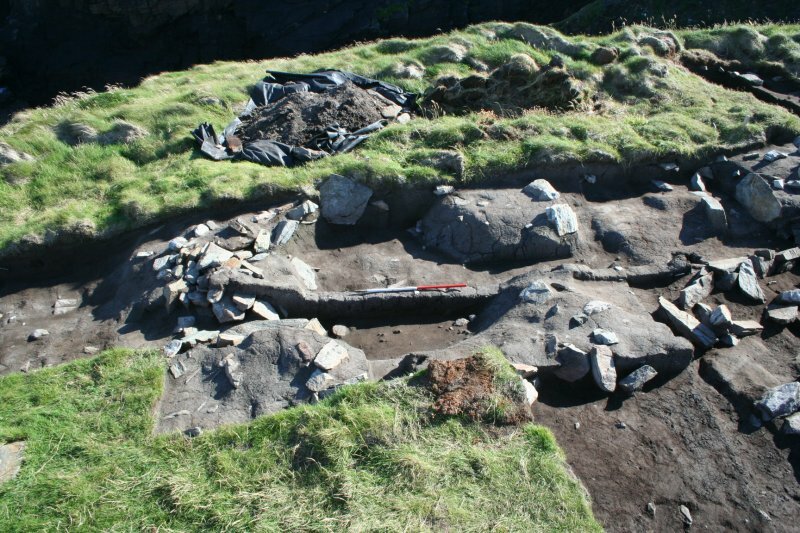 Four excavation areas were opened in 2007. 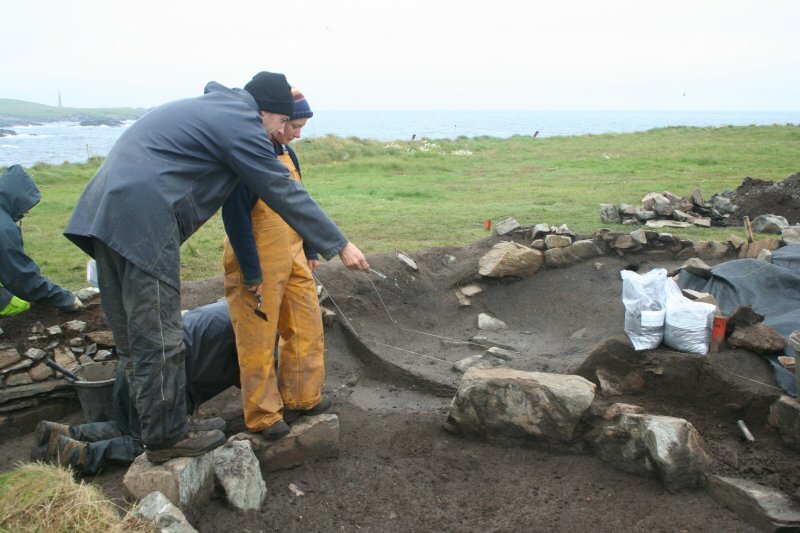 New trenches were opened over a large, well preserved building, Structure C, and one of two smaller circular buildings, Structure F, at the head of a natural gully on the E side of the island. 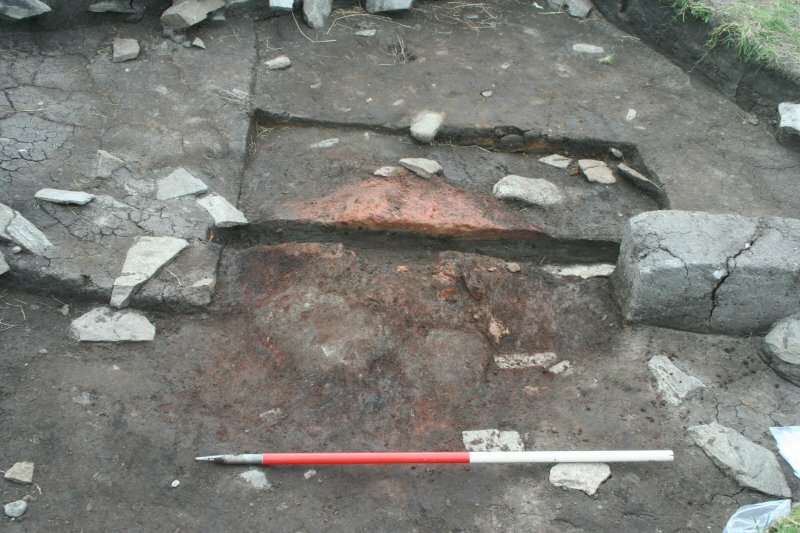 Trenches were also re-opened over a group of buildings at Structures D and the base of a ruined tower, Structure G, in order to complete the excavation of features uncovered in 2006.
burnt deposits associated with the use of the kiln had been robbed and modified when, after the barn had gone out of use, two small circular turf and stone shelters were built into the NW and central areas of the structure. 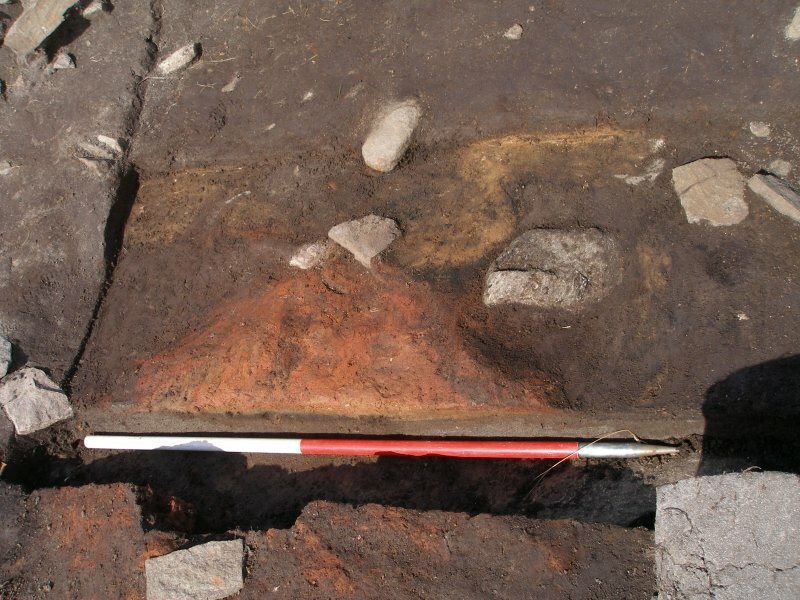 A small finds assemblage of coarse pottery, a sherd of glass and a musket ball was recovered from these later structures, which had disturbed earlier floor deposits below associated with the barn. 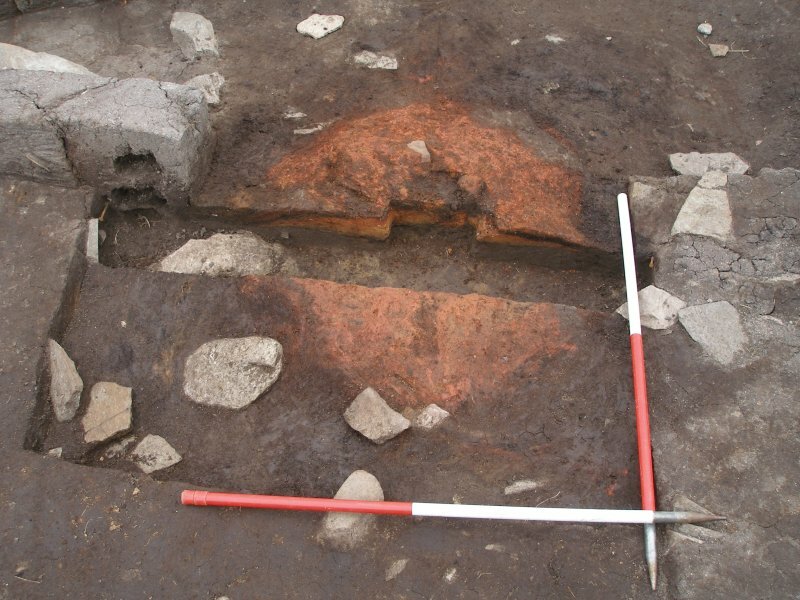 Work in Trench D revealed three phases of buildings and occupation across the area. 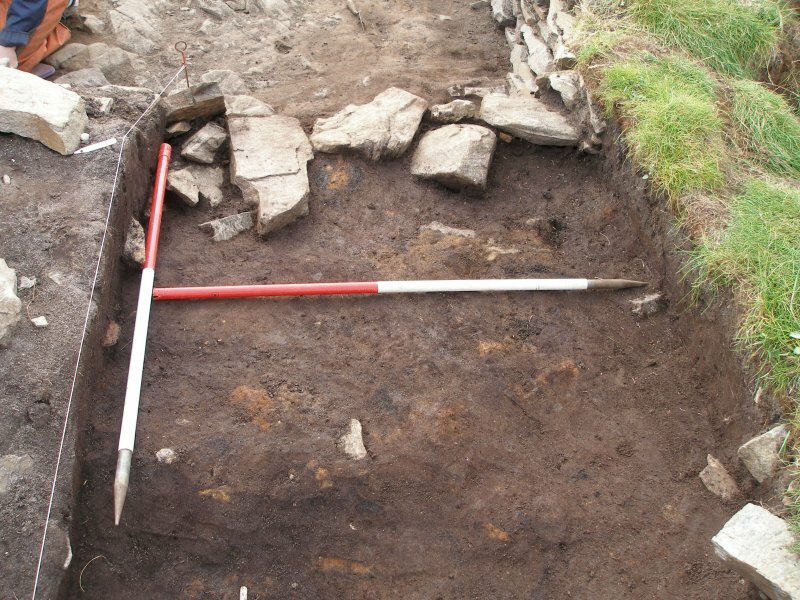 The earliest phase comprised the remains of an old ground surface, the stone footings of the corner of a building, an occupation layer and a thick ashy midden deposit. 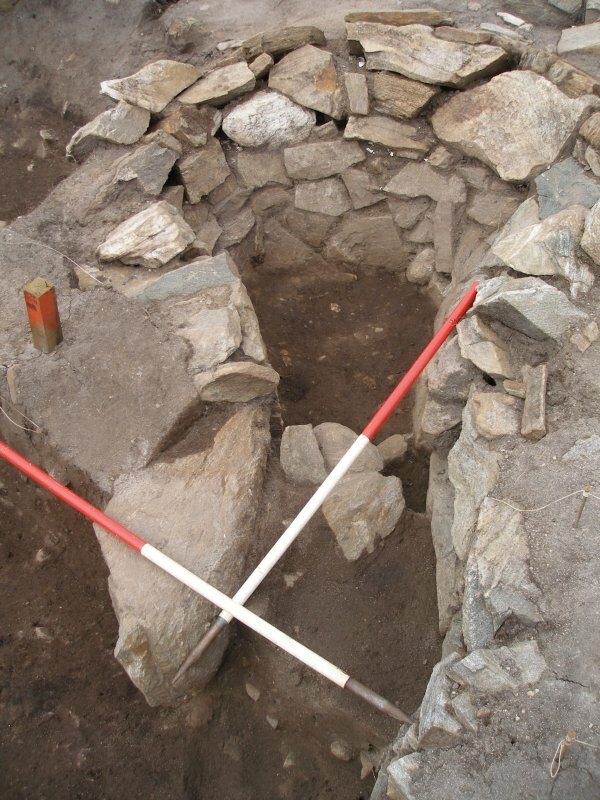 Above this two separate areas of activity were excavated: in the E. a large circular hearth interpreted as a communal cooking hearth, and to the W a large rectangular courtyard area containing several phases of floor and heath deposits. 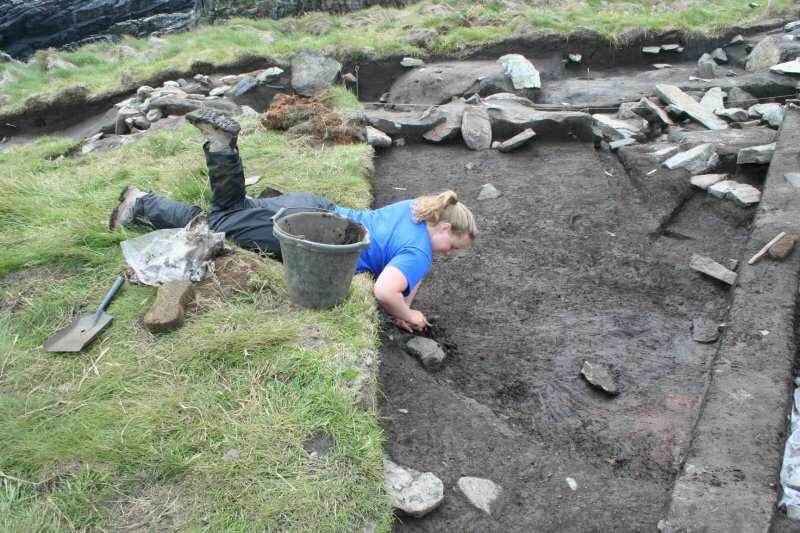 The finds from this phase are broadly datable to the 16th to early 18th centuries, and include pottery, bone, charcoal, iron objects and flint flakes deriving from fire-lighting. The range of material is in keeping with broadly domestic occupation, but with indications of episodes of conflict, as witnessed x the consistent finds of pistol and musket shot. 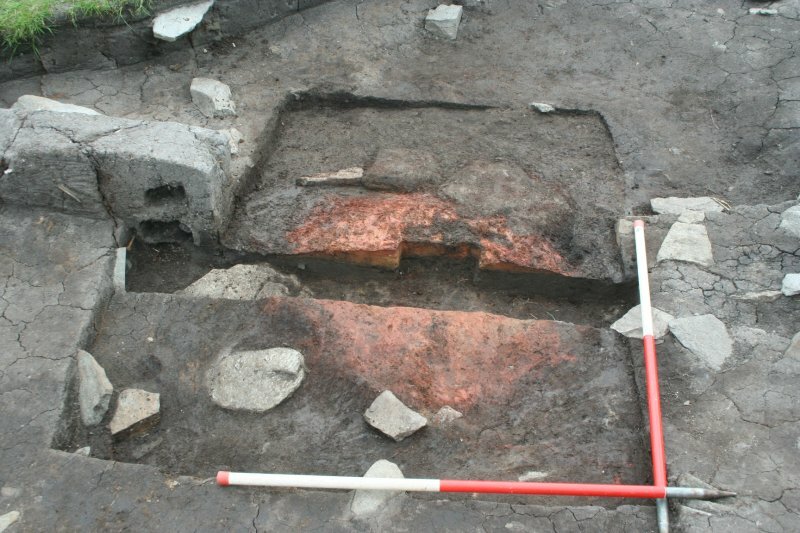 The latest phase of buildings consisted of small, sub-rectangular buildings constructed from turf walls with rough stone facings, from which 19th-century glazed pottery was recovered. In Trench F the eastern of two scoops or terraces, Structure F, was excavated and a D-shaped turf and stone building was uncovered. The back of the building had been set into the hillside above Palla na Biorlinn, a gully leading down to a rocky ledge where tradition records a landing place on which the Morrisons would pull up their boats. 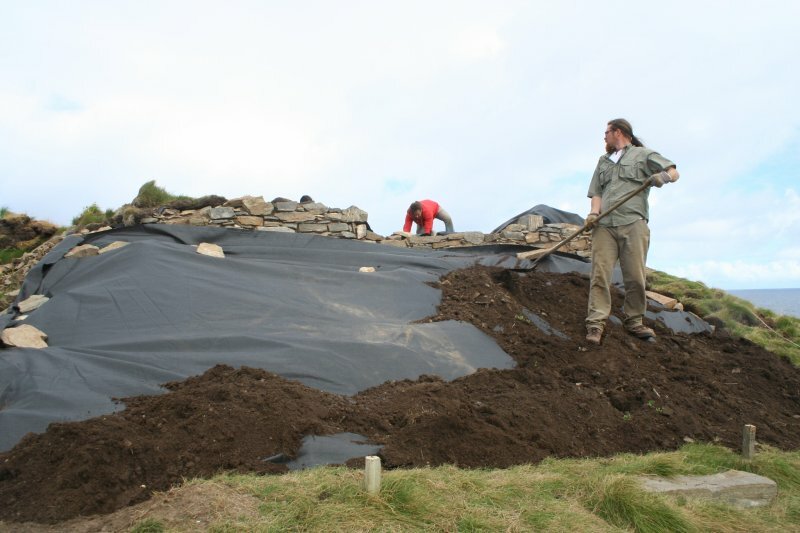 A turf wall was set onto the back of the terrace, with a dry stone face at the base defining the curved interior. 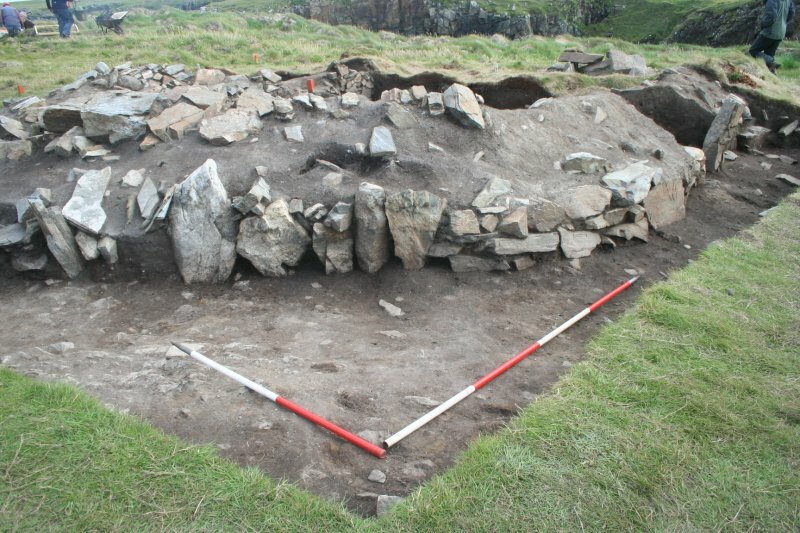 The front wall of the structure was built from double faces of neat stonework, with a turf core, and a doorway looking out to the sea and down the Minch. 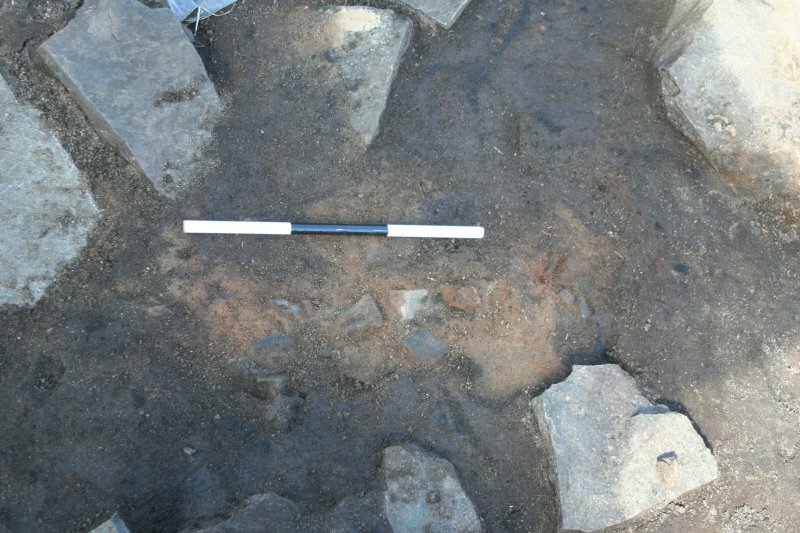 A wooden threshold and scatters of coarse pottery sherds and charcoal were excavated at the doorway, while inside the building two phases of occupation were identified, overlying a carefully built drain to channel water out from the slope behind. Finds from this trench included flakes of flint from firelighting, a small group of iron objects, a musket ball and two small pieces of glass. 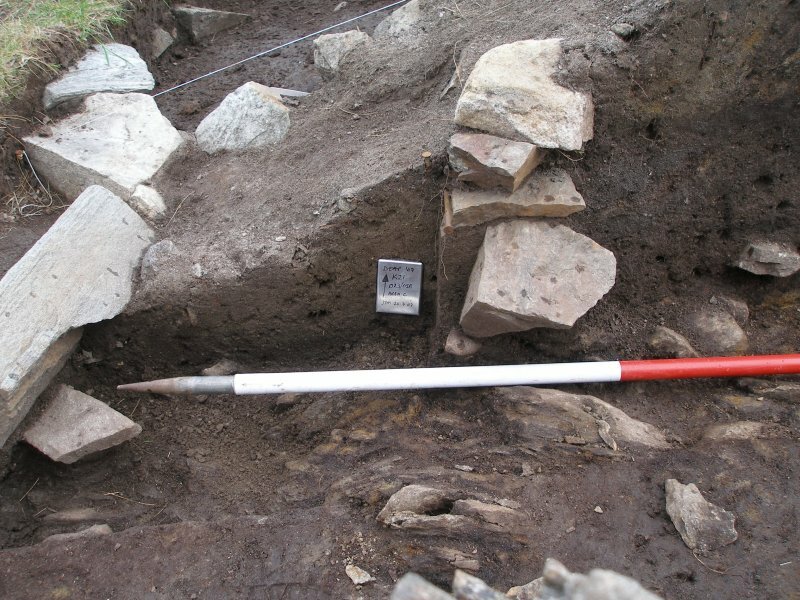 The same broad dating is suggested for this trench, and the finds assemblage again provides a picture of domestic habitation and episodes of conflict. 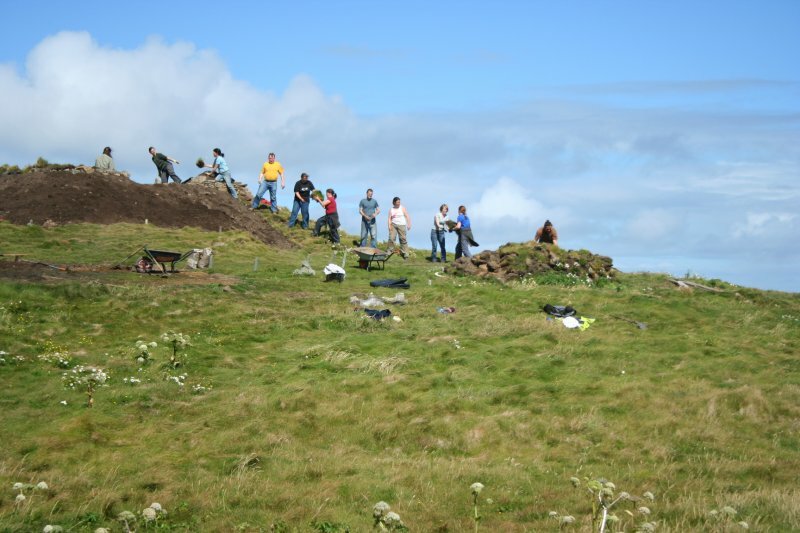 A small part of Trench G was re-opened in 2007 in the centre and to the S of Structure G, the base of a ruined rectangular tower on the highest point of the island. A new extension was also opened to the N on the seaward side of the structure to investigate the N face of the base of the tower wall. Investigation in the interior of the tower identified two phases of collapsed tower, and there is evidence that there was a flaw in execution of the first phase of construction which caused the initial collapse. 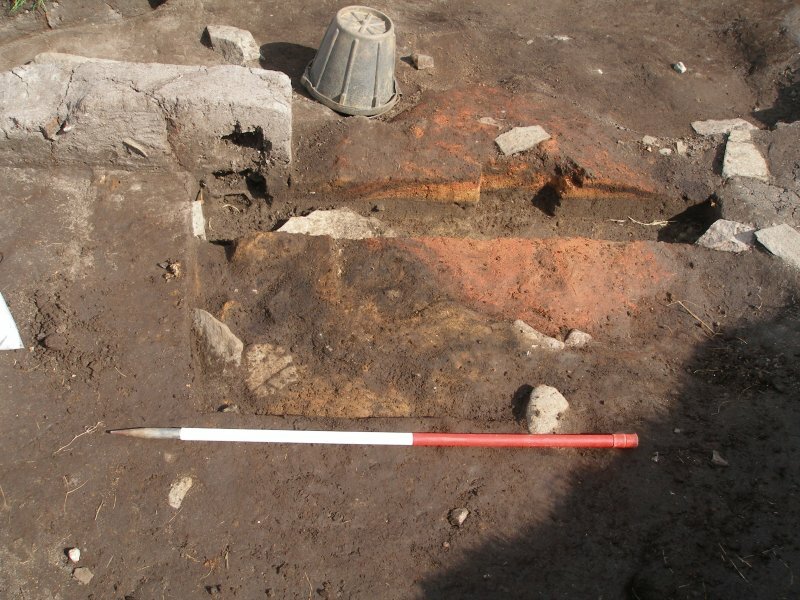 Finds of coarse pottery, a sherd of imported glazed pottery and pistol shot in the collapsed tower suggest that this building is contemporary with the other structures on the site. Archive to be deposited in Museum nan Eilean. Report deposited with SMR and RCAHMS. 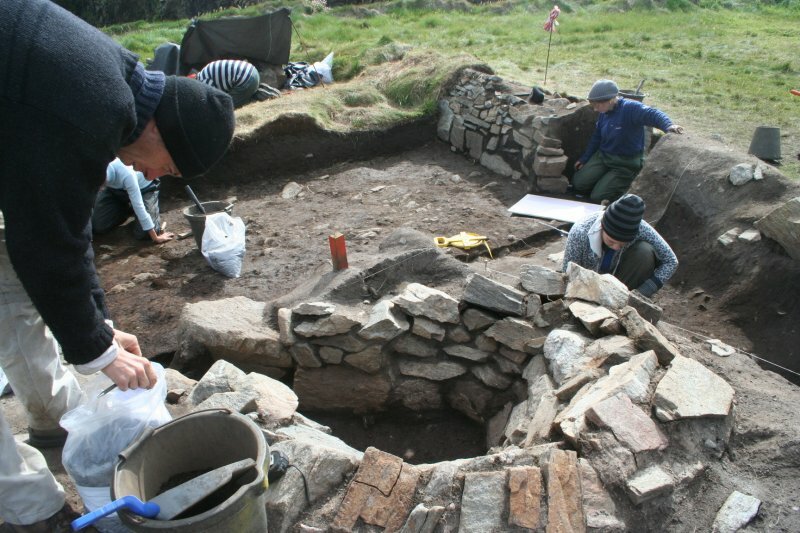 Funder: Heritage Lottery Fund; Historic Scotland; Comhairle nan Eilean Siar; Comunn Eachdraidh Nis; Comunn na Gàidhlig; Clan Morrison Society; Glasgow University. Dun Eistean is a cliff-girt rock stack cut off from the mainland by a precipitous sea-swept ravine, and has only recently become accessible via a footbridge. 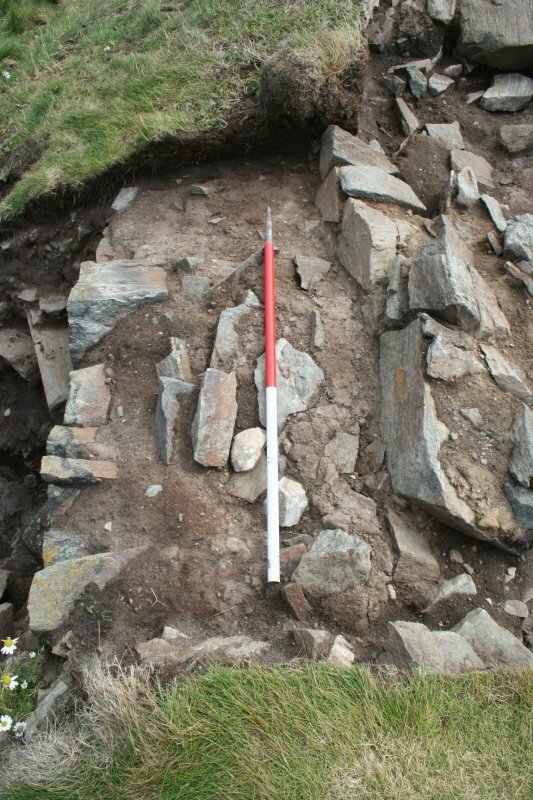 An area measuring about 90m from E to W by up to 60m transversely (0.48ha) is enclosed by a grass-grown bank, which has been shown by excavation to be the remains of a stone-faced turf rampart (Barrowman 2002), extending along the S margin of the stack above the ravine and returning at either end. 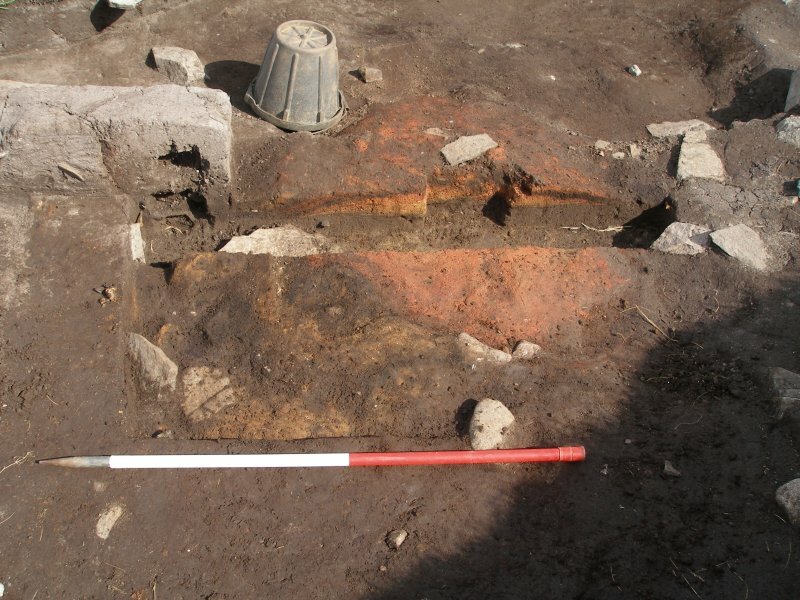 Remains of a series of buildings can be seen within the interior, one of which is the stump of a tower (Barrowman 2001; 2005). Traditionally a stronghold associated with the Morrisons since the 16th century, the excavations have also demonstrated earlier medieval phases, but though it has often been assumed a likely site for a prehistoric predecessor (eg the Scheduling document), there is no evidence that this was the case.